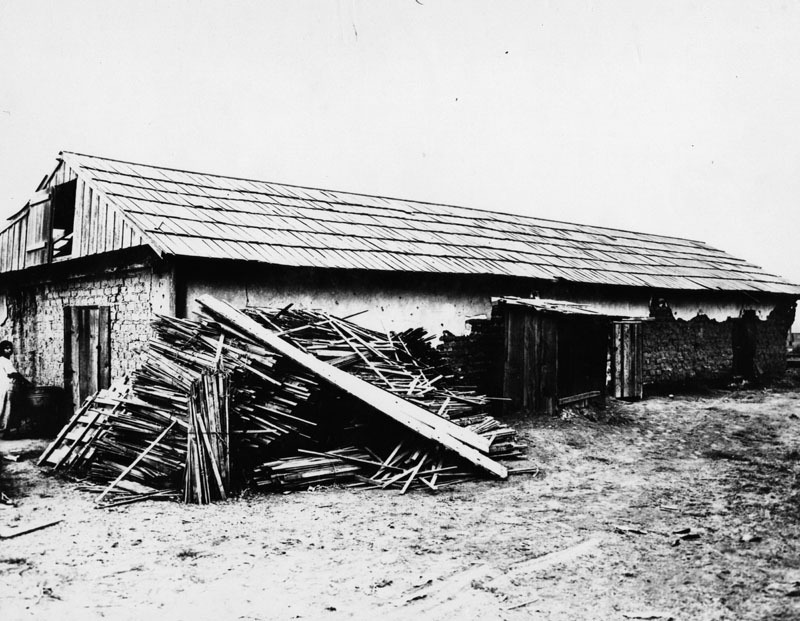 Following the Mexican War, Pío Pico, last Mexican governor, acquired 9,000-acre Rancho Paso de Bartolo and built here an adobe home that was destroyed by the floods of 1883-1884. His second adobe casa, now known as Pío Pico Mansion, represents a compromise between Mexican and American cultures. While living here the ex-Governor was active in the development of American California. ca. 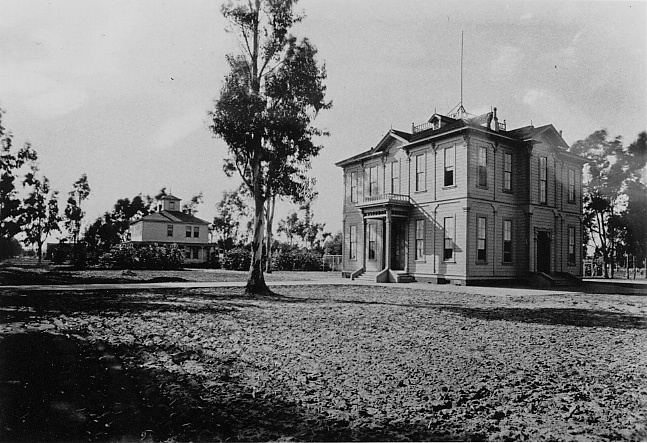 1895)^^ - Exterior side view of "El Ranchito" now known as the Pio Pico Mansion, Whittier, California. 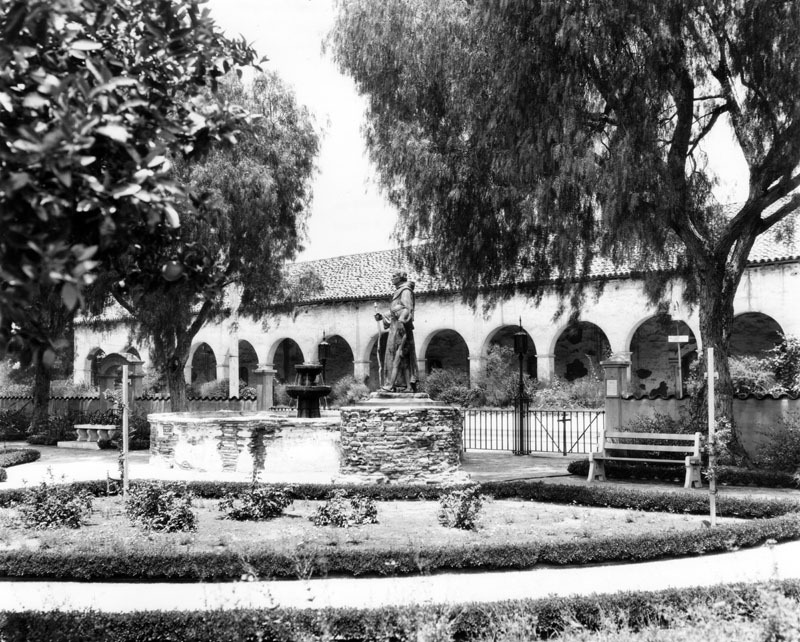 (1936)* - A view of the courtyard/patio area and well of the Pico Mansion Adobe, Pío Pico's favorite home, maintained by the State. Originally containing 36 rooms, 17 remained in 1936 by which time the adobe was restored to some extent but not furnished. Location: Pio Pico State Historic Park, 6003 Pioneer Blvd, Whittier. La Iglesia de Nuestra Senora la Reina de Los Angeles-the Church of Our Lady the Queen of the Angels-was dedicated on December 8, 1822 during California's Mexican era. Originally known as La Iglesia de Nuestra Senora de Los Angeles, the church was the only Catholic church for the pueblo. Today it primarily serves the Hispanic population of Los Angeles. 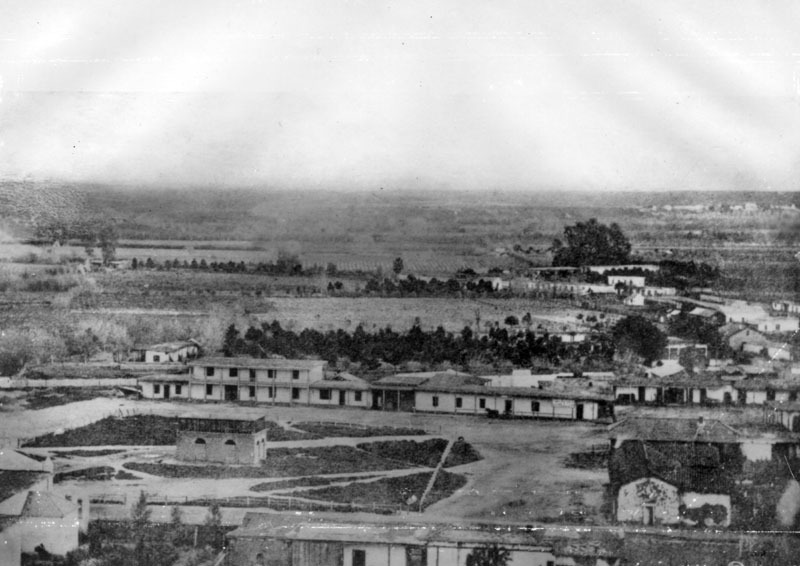 (1850)^*# - This is one of the earliest photos of Los Angeles, taken from a balloon. Looking northeast, the layout of the new city can clearly be seen with the Los Angeles Plaza located in the lower left-center. The large white structure to the left of the Plaza is the Old Plaza Church. The two streets running from bottom of photo to the Plaza are Main Street on the left and Los Angeles Street on the right. Alameda Street runs from the lower right corner diagonally toward the lower center of photo. The L.A. River can be seen running from the lower-right diagonally to the center of the photo, turns left and disappears behind the mountain. At that point the Arroyo Seco can be seen at its confluence with the LA River. The tall majestic San Gabriel Mountains stand in the far background. Vineyards blanket the area between the City and the L.A. River (lower right). The large dark spot in the lower-right of the photo is El Aliso, the historic landmark of the indigenous Tongva people who once lived in the Indian Village of Yangna at that location, adjacent to the L.A. River. Click HERE to see more Early LA City Views (1800s). 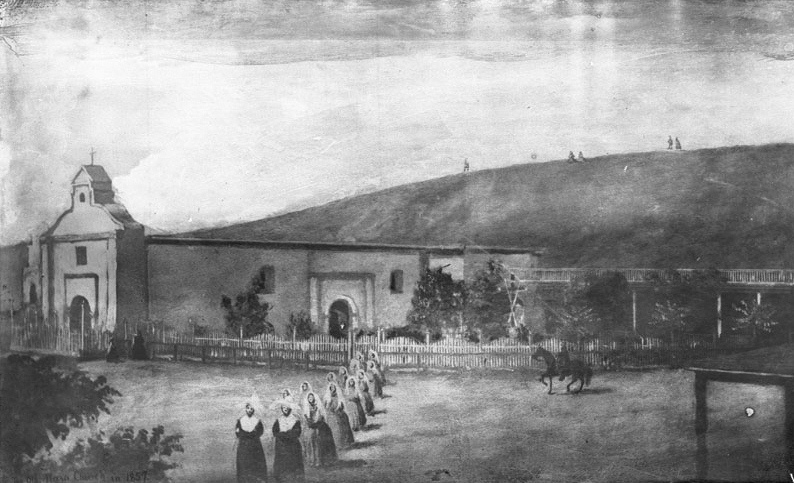 (1857)^^ - Photograph of a drawing (by a young lady pupil of Sister's School) of the Los Angeles Plaza Church with a group of 14 nuns processing in the foreground. A wooden picket fence extends from the church at left to the right. A horseman prances nearby (at right). Two people stand near the church entrance (at left). A few other people are visible on the bare hilltop behind. The flat roof of the mission was covered with tar from the La Brea Tar Pits. Drawn 1857. (ca. 1861)* - View of the facade of the 'Old Plaza Mission' (Plaza Church). The Plaza Church would be renovated in 1861, shortly after this photo was taken. The 'Church of Los Angeles' was founded on August 18, 1814 by Franciscan Fray Luis Gil y Taboada. 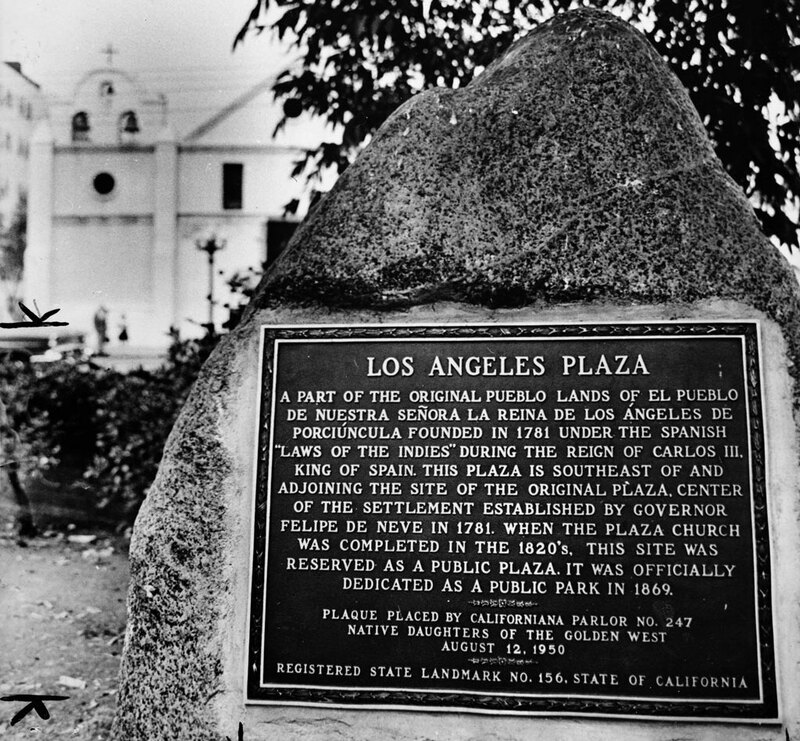 He placed the cornerstone for the new church in the adobe ruins of the original "sub-station mission" here, the Nuestra Señora Reina de los Ángeles Asistencia (founded 1784), thirty years after it was established to serve the settlement founding Los Angeles Pobladores (original settlers). The completed new structure was dedicated on December 8, 1822. A replacement chapel, named La Iglesia de Nuestra Señora de los Ángeles - for Mary, mother of Jesus or "The Church of Our Lady of the Angels" - was rebuilt using materials of the original church in 1861. The title Reina, meaning "Queen," was added later to the name. 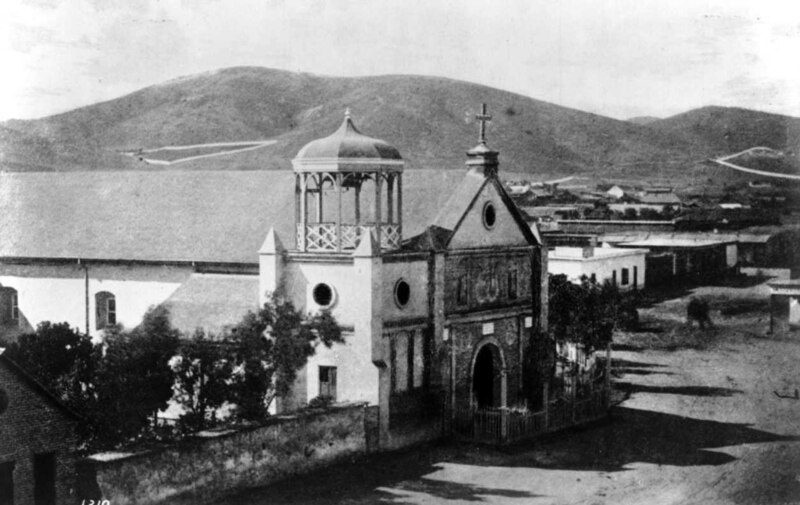 For years, the little chapel, which collected the nicknames "La Placita" and "Plaza Church," served as the sole Roman Catholic church in emerging immigrant Los Angeles. (1869)** - The Plaza and 'Old Plaza Church (Mission Nuestra Senora Reina de Los Angeles). The square main brick reservoir in the middle of the Plaza at the right was the terminus of the town's historic lifeline: The Zanja Madre (Click HERE to read more on the Zanja Madre). 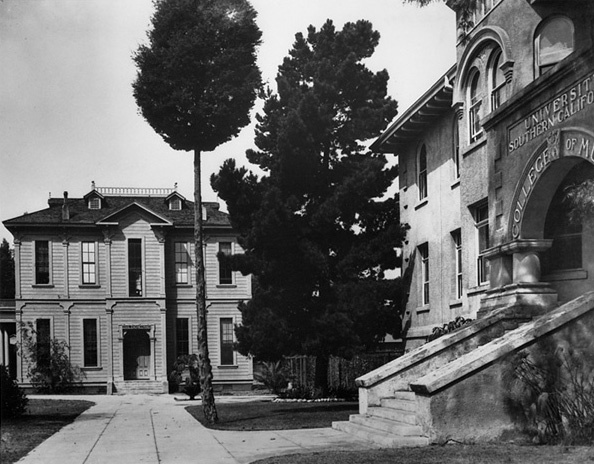 The building in the top right background was the Lugo House: first home to St. Vincent's College (now Loyola Marymount University). (1870)^^- View of the 'Old Plaza Church', shown here with its new gazebo-like roof structure. Note the bare hills in the background. Chavez Ravine, over the gazebo on the left, is where Dodger Stadium is today. (ca. 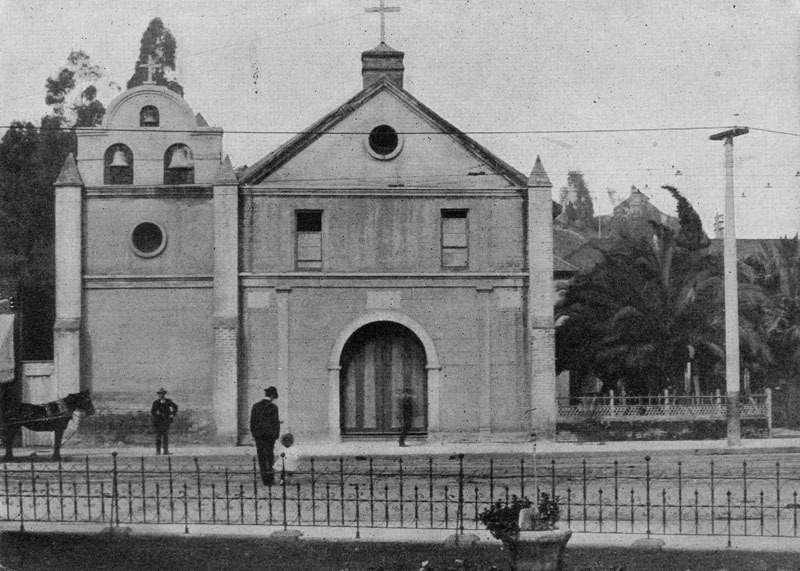 1900)^*# - Front view of the Old Mission Church with its newly installed "bell wall", similar to the one it had prior to 1861. There is a clear view of Los Angeles High School (2nd location, built in 1891) up on Fort Moore Hill and its relative relationship to the Plaza and the Plaza Church. 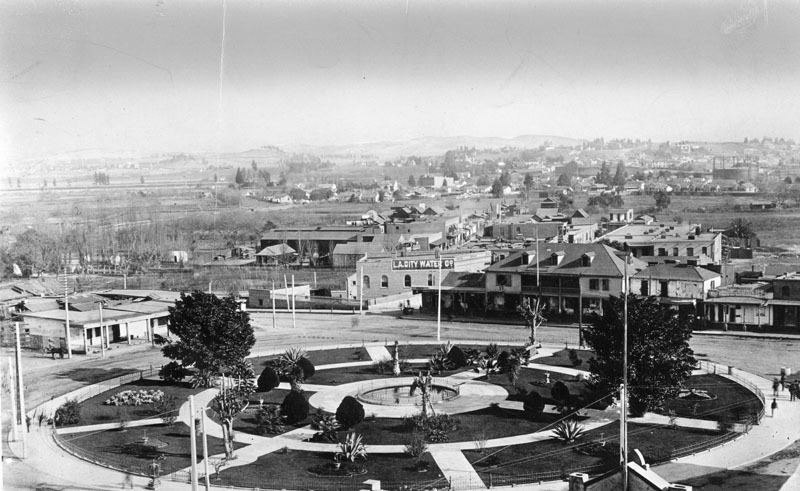 Click HERE to see more Early Views of the Los Angeles Plaza. Location: 535 N Main St near Macy St, Los Angeles. This adobe house was built ca. 1818 by Don Francisco Avila, alcalde (mayor) of Los Angeles in 1810. Used as Commodore Robert Stockton's headquarters in 1847, it was repaired by private subscription in 1929-30 when Olvera Street was opened as a Mexican marketplace. It is the oldest existing house in Los Angeles. (ca. 1869)^^ - Photograph of the L.A. Plaza and the entrance to Wine Street looking north from the Pico House, ca.1869. The Avila Adobe is visible on Wine Street (renamed Olvera Street in 1877). Click HERE to see more in Early Views of the L.A. Plaza. (ca. 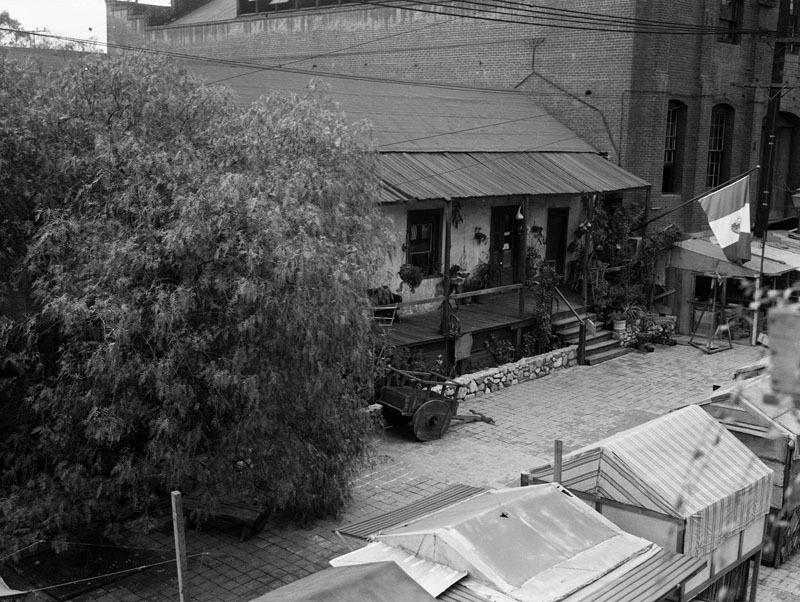 1935)* - Avila Adobe as seen from a building across Olvera Street. In front of the house is a wooden cart, and a Mexican flag is by the entrance. Location: El Pueblo de Los Angeles Historic Monument, Olvera St, Los Angeles. (ca. 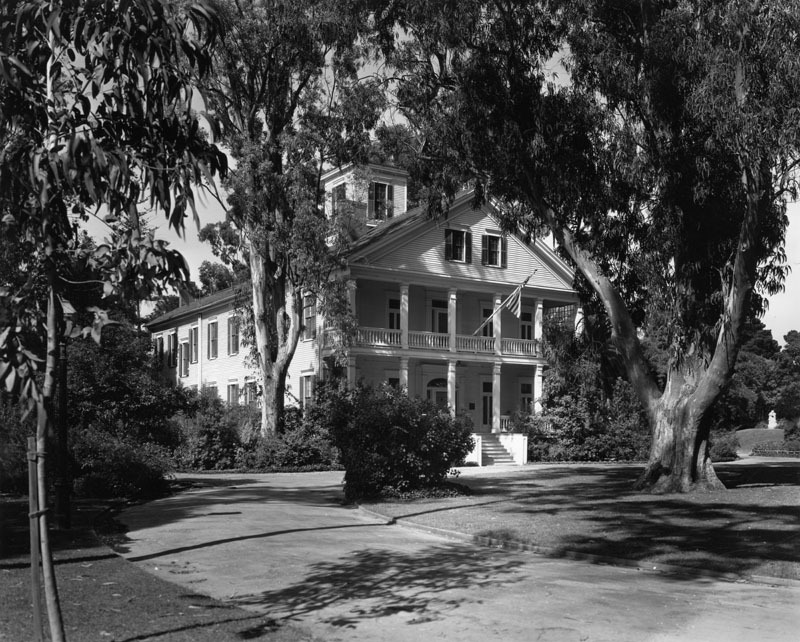 1937)* - Exterior view of the Greek Revival style residence of Phineas Banning, who was a businessman, stagecoach driver, entrepreneur, and often referred to as the 'Father of the Port of Los Angeles." The home has been preserved as the Banning Residence Museum and managed by the City of Los Angeles Department of Recreation and Parks. In 1963, the Banning House property, also known as Banning Park, was designated as a Los Angeles Historic-Cultural Monument No. 25 (Click HERE to see complete listing). It is also federally listed on the National Register of Historic Places. 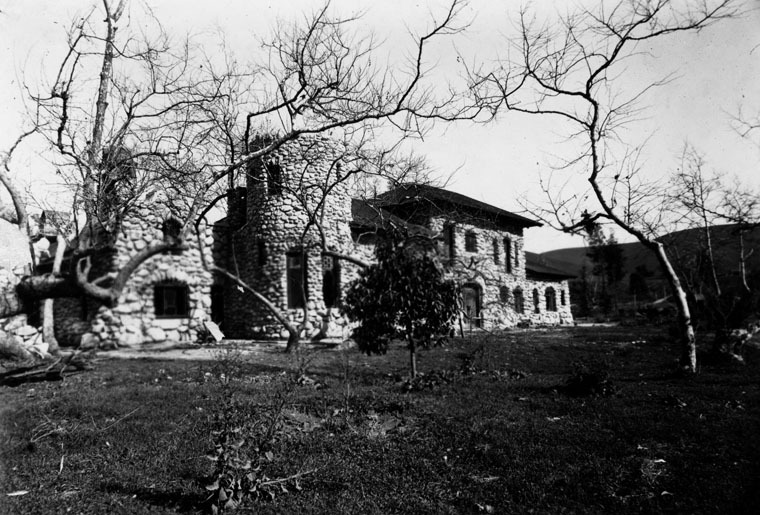 (1938)* - Exterior view of Phineas Banning's residence in Banning Park in Wilmington. Large trees and greenery may be seen on both sides of the home. (n.d.)#^* - Exterior rear view, looking northeast, of the General Phineas Banning House, built in 1864 in the Greek Revival style. Location: 401 East M St at Banning Place, Wilmington. Brand Park, also called Memory Garden, was given to the city for a park November 4, 1920. It is a part of the original land grant of Mission San Fernando de Rey de España, and the colorful and picturesque atmosphere of the early California missions is preserved in Memory Garden. (ca. 1926)^^ - View of Brand Park across the street from the San Fernando Mission, ca.1926. An adobe archway can be seen in the foreground, its opening partially blocked by a low wrought iron gate. Beyond the archway, a neatly landscaped courtyard is visible. Low hedges surround planters where thin trees stand above large bushes. A fountain can be seen in the middle of the courtyard, and a line of light-colored adobe archways is visible in the background at center. In the foreground a sign on the gate reads "A Los Angeles Park open to the public", while writing on the ground reads "No Bicycle Riding". (Early 1900s)* - Brand Park is a beautiful and spacious park located at 15174 San Fernando Mission Boulevard, across the street from Mission San Fernando Rey de España. It features an old soap works, the original mission fountain - which now stands some 30 feet from its first location and shows significant signs of deterioration, and a large and oddly shaped reservoir from which the mission fathers were supplied with water. At the entrance to Brand Park is Barnham's life-sized statue of Father Junípero Serra, with his arm around an Indian boy. Various trees and plants cover the grounds in this courtyard, where bullfights were once held. Location: 15174 San Fernando Mission Blvd, Los Angeles. 'Here was made the Treaty of Cahuenga by General Andrés Pico, commanding forces for Mexico, and Lieutenant-Colonel J. C. Frémont, U.S. Army, for the United States. By this treaty, agreed upon January 13th, 1847, the United States acquired California - finally secured to us by the treaty of Guadalupe Hidalgo, made February 2nd, 1848.' This legend was written February 9, 1898 by Mrs. Jessie Benton Frémont. (1931)* - Hugo Ballin's mural depicting the singing of the Treaty of Cahuenga is mounted in the lobby of the Guarantee Trust Building at 5th and Hill Streets. 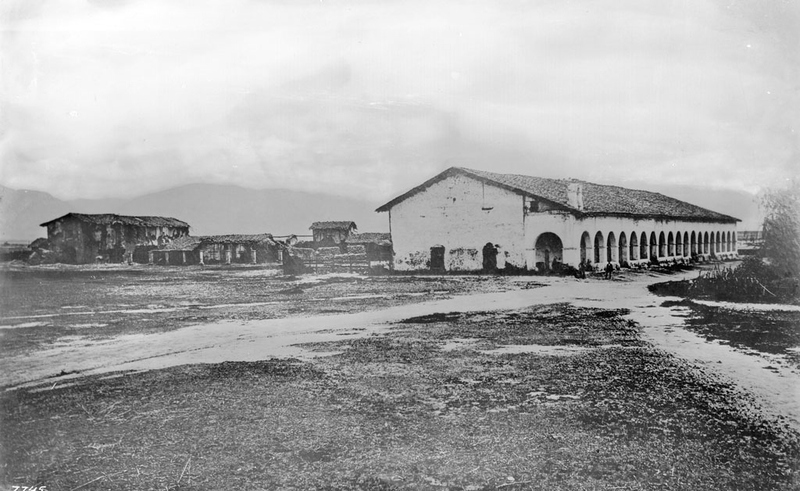 (1928)* - Campo de Cahuenga, site of the signing of the Treaty of Cahuenga in 1847. 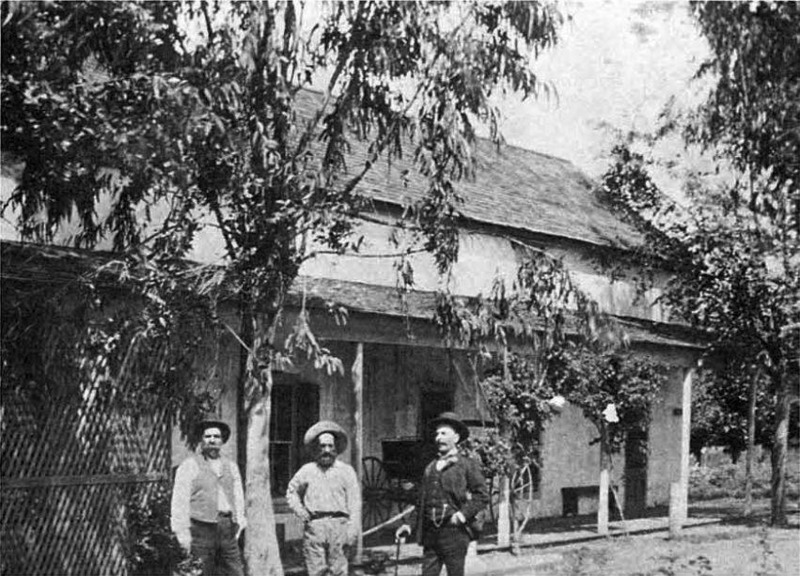 The Campo de Cahuenga, near the historic Cahuenga Pass in present day Studio City, was an adobe ranch-house on the Rancho Cahuenga where the Treaty of Cahuenga was signed between Lieutenant Colonel John C. Frémont and General Andrés Pico in 1847, ending hostilities in California between Mexico and the United States. The subsequent Treaty of Guadalupe Hidalgo of 1848, ceding California, New Mexico, and Arizona (but not Texas, since it had seceded from Mexico in 1836, declared itself a republic, and joined the union in 1845) to the United States, formally ended the Mexican-American War. 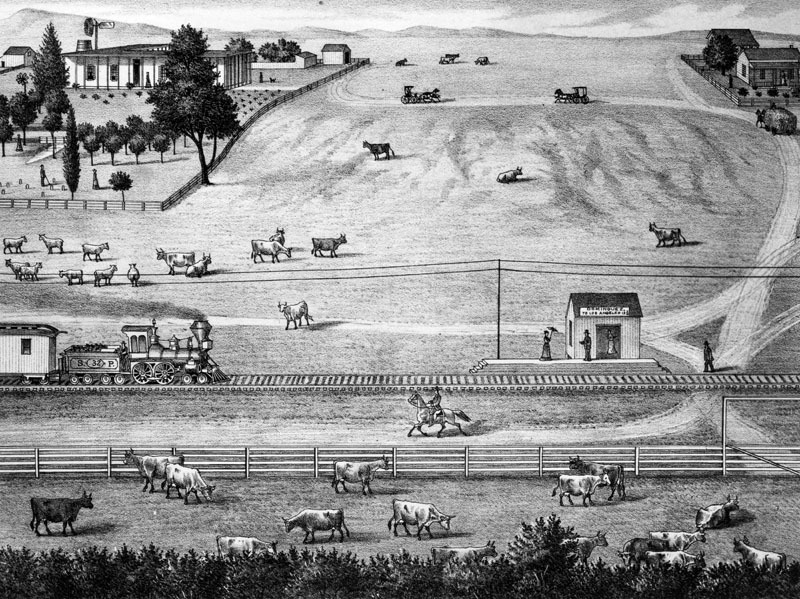 From 1858 to 1861 the Campo de Cahuenga became a Butterfield Stage Station. 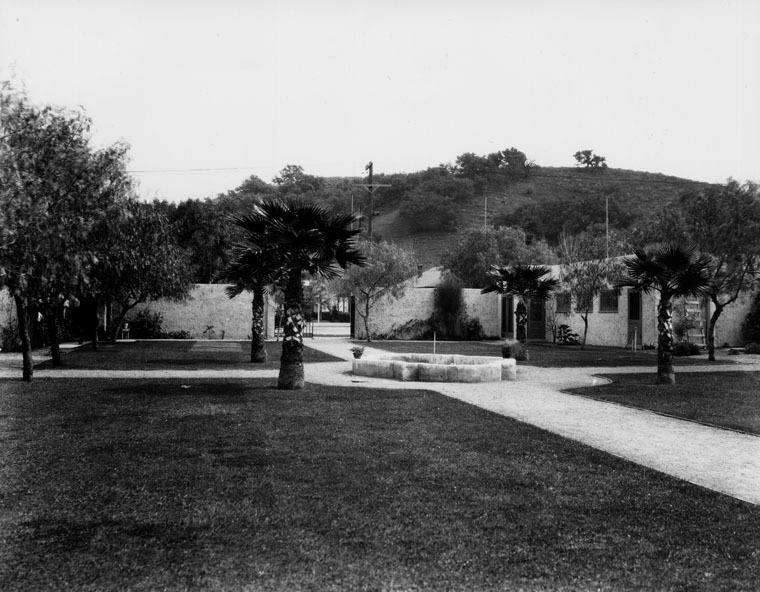 (1928)* - Campo de Cahuenga, site of the signing of the Treaty of Cahuenga. Click HERE to see more Early Views of the San Fernando Valley. Location: 3919 Lankershim Blvd, North Hollywood. 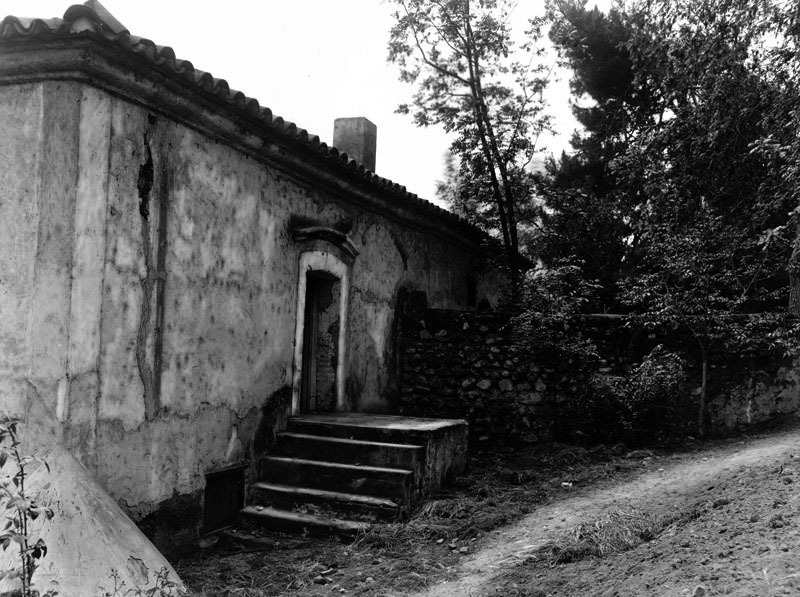 The central portion of the ranchhouse was built in 1826 by Manuel Domínguez. 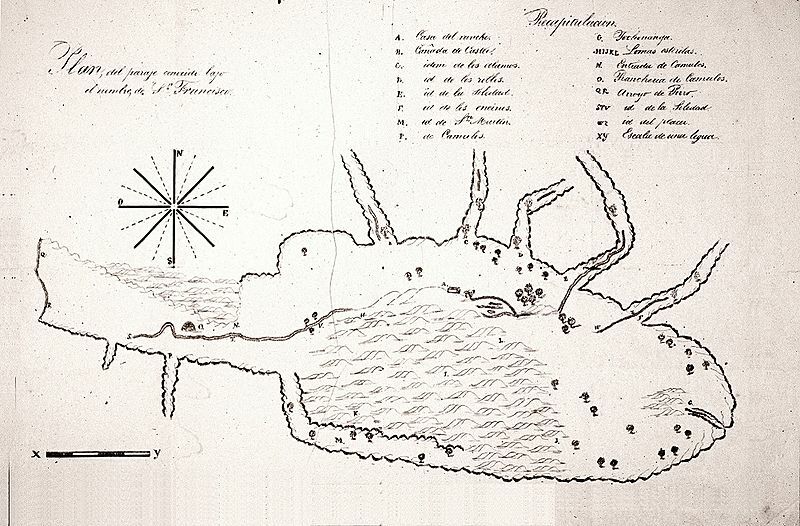 Rancho San Pedro, ten square leagues granted provisionally by Governor Fages to Juan José Domínguez in 1784, was regranted by Governor Solá to Cristobal Domínguez in 1822. In the battle of Domínguez Ranch, fought here October 8 and 9, 1846, Californians led by José Antonio Carrillo repelled United States forces under Captain William Mervine, U.S. Navy, in an attempt to recapture the Pueblo of Los Angeles. (1800s)* - George H. Carson standing on the far right, and Mrs. Carson on the far left, at the Dominguez adobe. Mrs. Carson’s father was Don Manuel Dominguez, a wealthy sheep raiser, who inherited the Rancho San Pedro of 24,000 acres from his father, Don Christobal Dominguez, a commissioner of Spain, who had inherited it from his uncle, Don Juan Jose Dominguez, to whom the property had been granted by the Spanish throne. In 1839, Don Manuel Dominguez was elected Second Alcalde of Los Angeles; In 1843 he became prefect from the second district of California, and in 1849 he was a delegate to the Constitution Convention of California. (ca. 1880)* - Drawing of the Dominguez family Rancho San Pedro, later Historical Landmark No. 152. A railroad line passed through. Location: 18127 S Alameda, Compton. 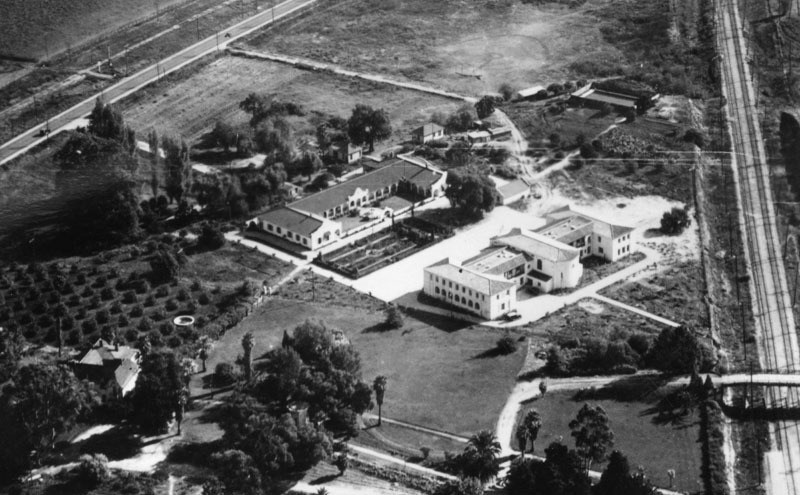 (n.d.)* - Aerial view of the restored Dominguez adobe and the Claretian Seminary across the way on Rancho San Pedro. 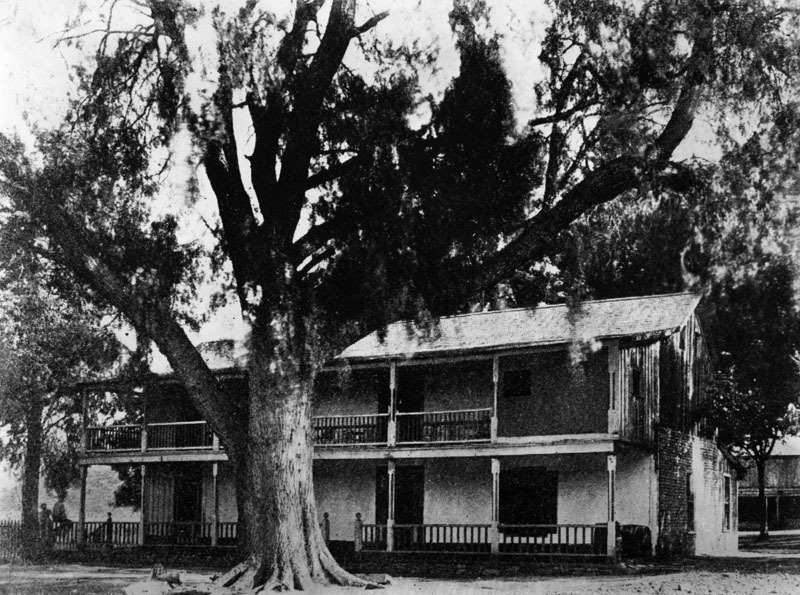 Upon Manuel’s death in 1882, and the passing of his wife one year later, the Rancho lands were partitioned among his six surviving children, all daughters. Three of the married daughters continued the Dominguez legacy through the Carson, Del Amo and Watson families. (ca. 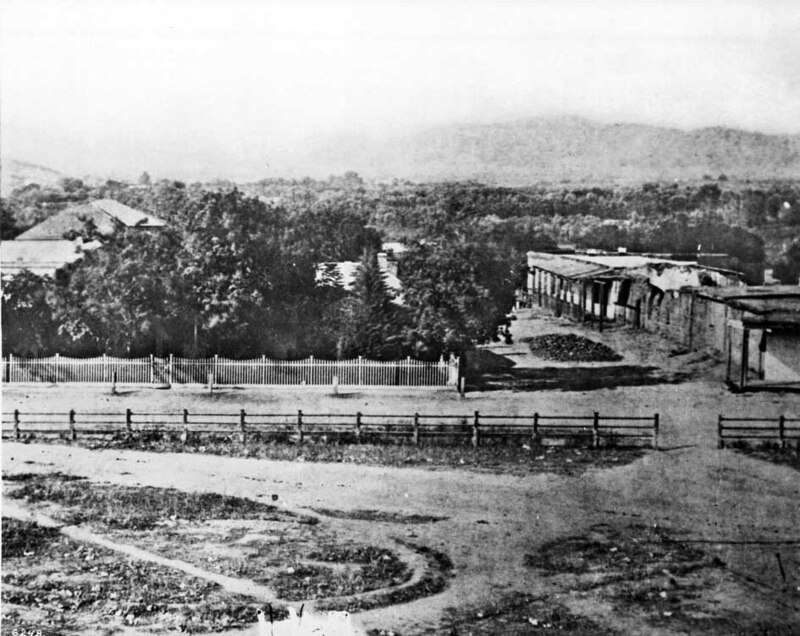 1858)** - This is the earliest known photograph of the Los Angeles Plaza. There is a square main brick reservoir in the middle of the Plaza, which was the terminus of the town's historic lifeline: the Zanja Madre ('Mother Ditch'). The reservoir was built in 1858 by the LA Water Works Company. 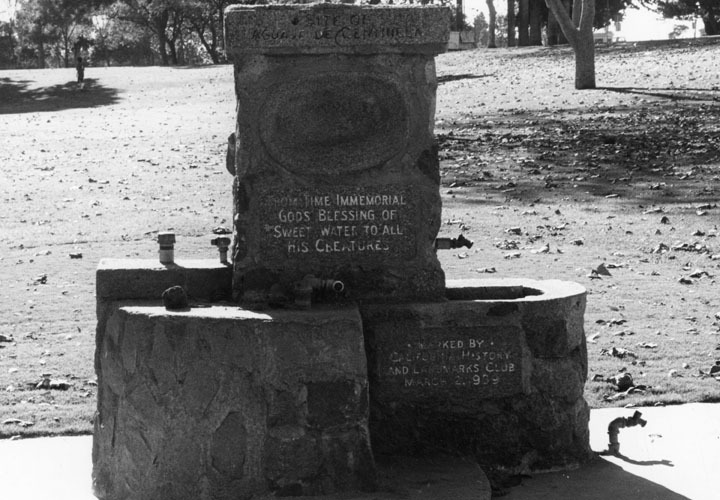 Click HERE to read more about the Zanja Madre and Los Angeles' first water supply. (n.d.)** - Sign for the Los Angeles Plaza. It reads "Historical landmark, State of California, No.156." People sitting in the park can be seen in the background. 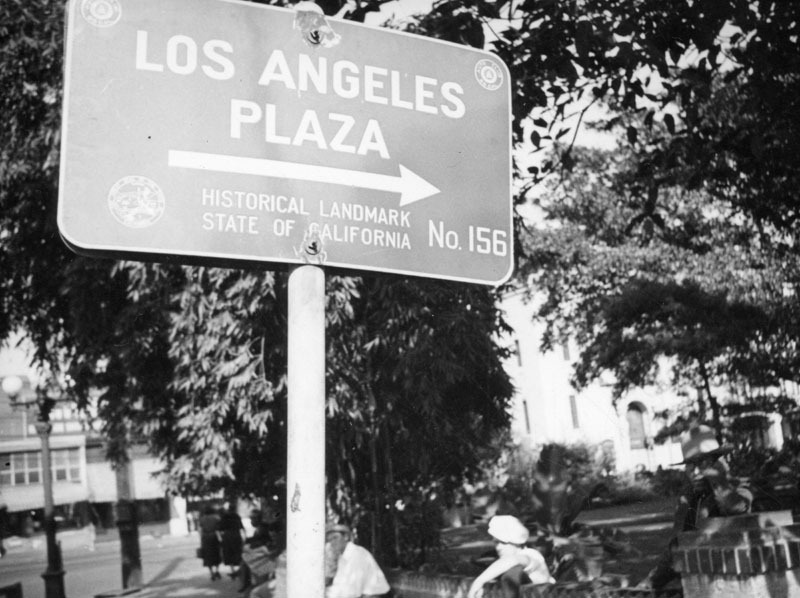 (1961)^^ - View of landmark plaque in the Los Angeles Plaza. Mission San Fernando Rey de España was founded by Father Lasuén in September 8, 1797. 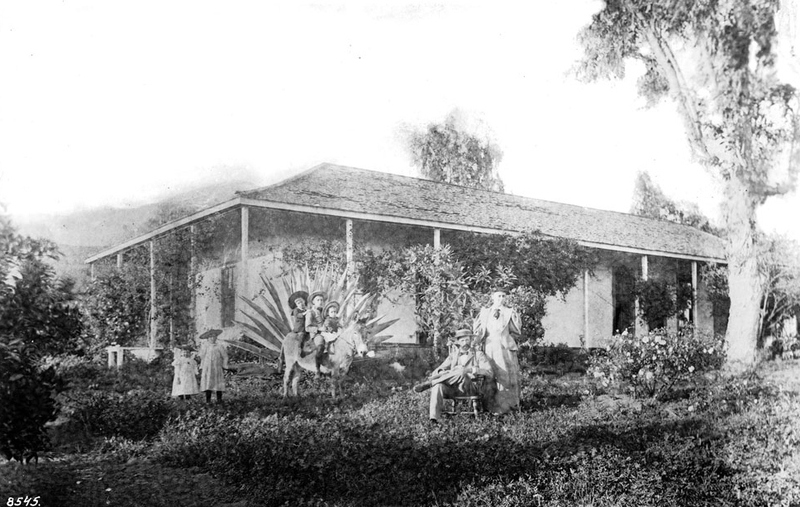 A house belonging to Francisco Reyes, on Encino Rancho, furnished temporary shelter for the missionary in charge. An adobe chapel, built and blessed in December 1806, was damaged by the destructive earthquake of 1812 - a new church was completed in 1818. (1800s)** - View of the Convento Building, also known as the "Long Building". Two families stand next to their horse-drawn carriages, which have stopped along the road that would eventually become "El Camino Real". Location: 15151 San Fernando Mission Blvd, Mission Hills. Also listed on the National Register of Historic Places: NPS-88002147. (ca. 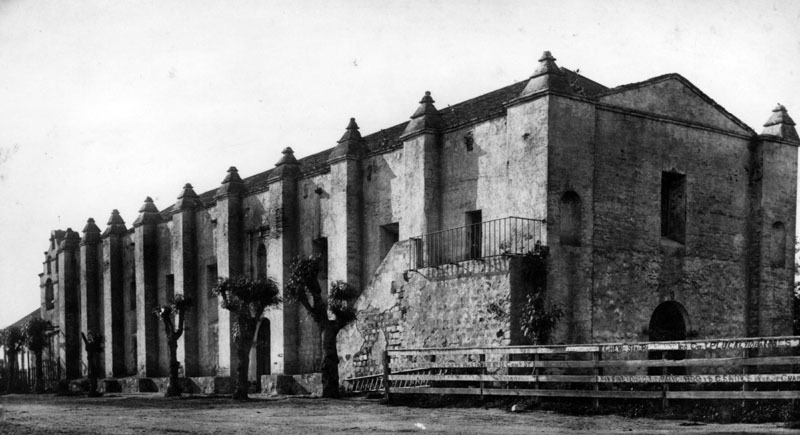 1870)^^ - Exterior view of the Mission San Fernando, ca.1870. 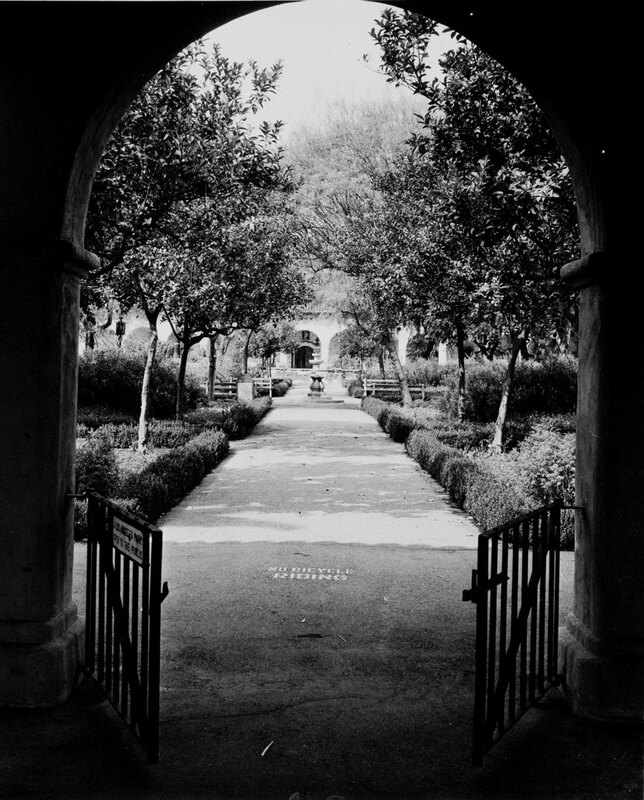 Two dirt paths enter in from the foreground, intersecting at the adobe cloister of the mission, which stands to the right of center. A collection of archways holds the eaves of the terracotta-tiled roof up over the cloister's patio. More adobe buildings can be seen to the left, with two-story adobe building standing to the left of an older cloister whose roof has collapsed. The mission was founded September 8, 1771 by Padres Pedro Benito Cambon and Angel Fernández de la Somera. The present church building was begun during the latter part of the 18th century and completed in the year 1800. (ca. 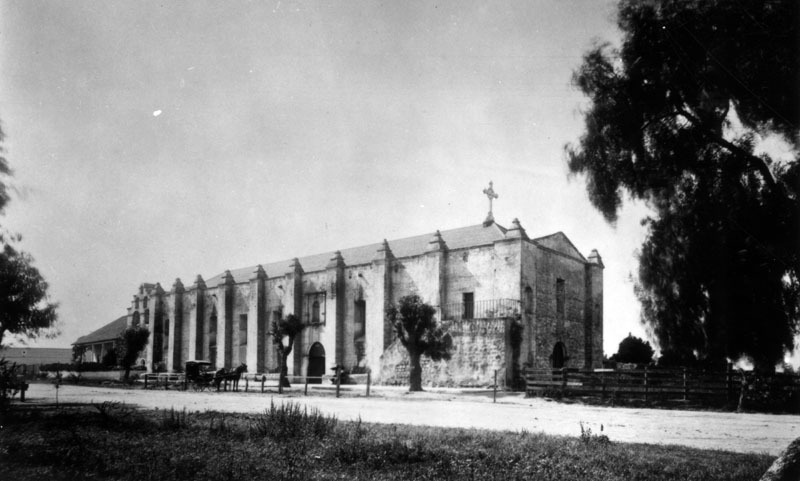 1870)* - Early view of the south facade of Mission San Gabriel Arcangel in San Gabriel, showing the 6-bell campanario on the left, and an exterior staircase can be seen on the right corner, which leads to the choir loft. When this photograph was taken the area looked barren except for the adobe dwelling attached to the left of the church. The dirt road was part of "El Camino Real" - the 600-mile California Mission Trail connecting the former Alta California's 21 missions. The Moorish influence of the mission is evidenced by the Buttressed walls, vaulted roof, and fortress-like appearance. The walls are original and are over four feet thick, with sections through the buttresses as much as seven feet thick. Architecturally, the San Gabriel Mission is unique among the California Missions. 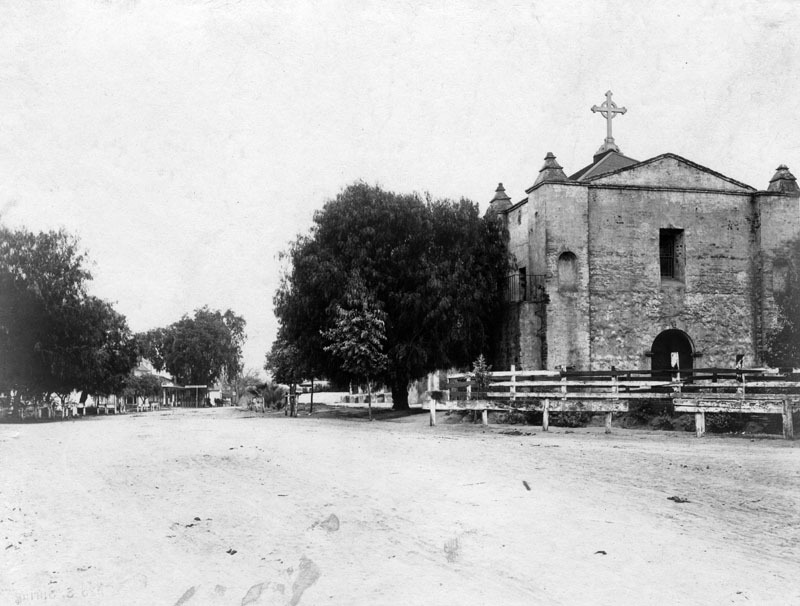 (Late 1800s)* - View of the western end and south facade of Mission San Gabriel Arcangel. When this photograph was taken, the road was still unpaved, the trees planted along the south side were fairly young (these were later replaced with palms), this side of the church was fenced in, and it had not yet placed the large cross that would rest atop this entrance for many years to come. Note the writing on the wooden fence. Many merchants used this space to "advertise" their goods, which included furniture, tobacco, clothing, drug pharmacy, and guns & ammunition - possibly businesses located in close proximity to the mission. 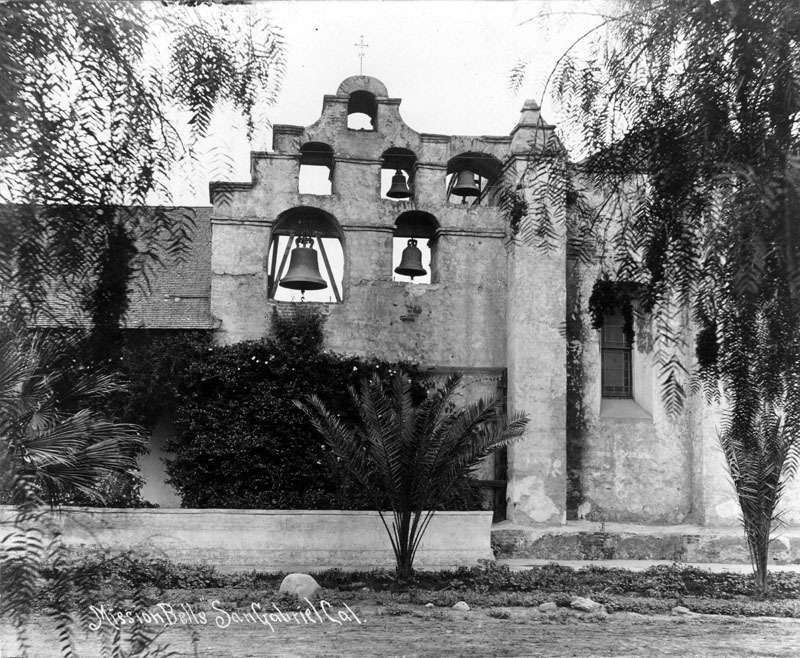 (19--)* - View of the western end and south facade of Mission San Gabriel Arcangel; a lone horse and buggy can be seen parked along the road. 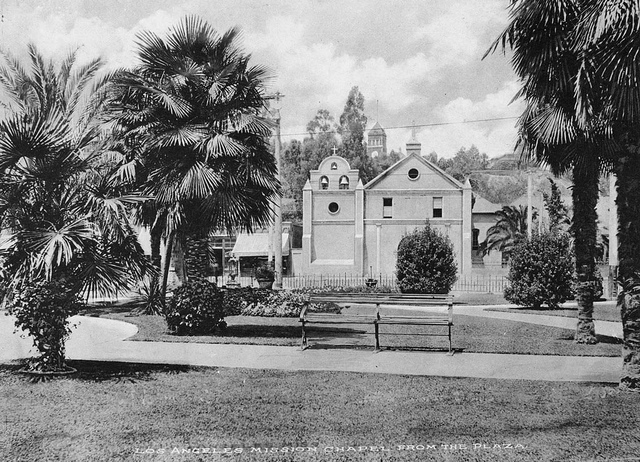 When this photograph was taken, the road was still unpaved, the trees planted along the south side were starting to grow lush (these were later replaced with palms), this side of the church was fenced in, and it had recently placed the large cross that would rest atop this entrance for many years to come. (1900)* - Early view of the six-bell "campanario" (or "bell wall") located adjacent to the chapel's east facade, at the far end of the church, with a thin but ornate cross at the very top. This large six-bell campanario was built after the original three-bell structure toppled during the 1812 Wrightwood Earthquake. In olden times, bells were vitally important to daily life at any mission. The bells were rung at mealtimes, to call the Mission residents to work and to religious services, during births and funerals, as well as to signal the approach of a ship or returning missionary, etc. When this photograph was taken, the palm trees were still saplings and the road had not yet been paved. 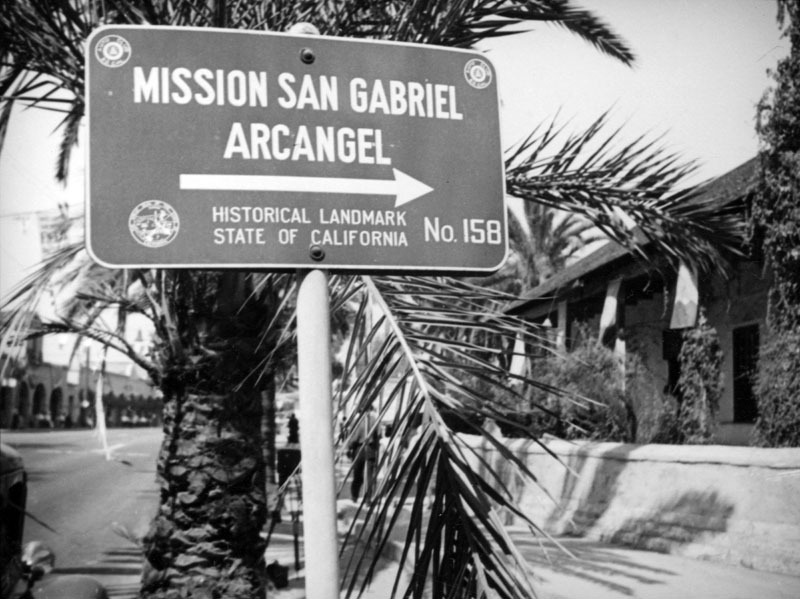 (19--)* - View of a sign located on the sidewalk along Mission Drive pointing toward Mission San Gabriel Arcangel. The sign shows an arrow pointing right, with "Historical Landmark No. 158 - State of California" written below it. The Automobile Club of Southern California posted such signs before local government took over the responsibility. A portion of the Mission Museum is visible behind the palm fronds. Location: 537 W Mission Dr at Junipero St, San Gabriel USGS Quadrangle Sheet Name: EL MONTE. Listed on the National Register of Historic Places: NPS-71000158. 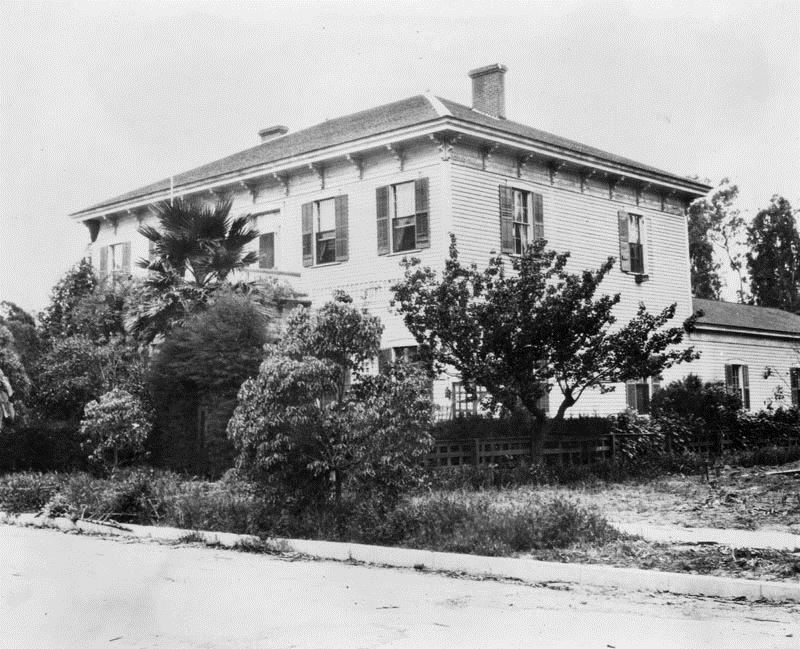 (1875)* - The Pico House, built by Pio Pico 1869-70. There is a stage coach in front of the hotel. Location: El Pueblo de Los Angeles Historic Monument, 400 block of Main St, Los Angeles. Listed on the National Register of Historic Places: NPS-72000231. (ca. 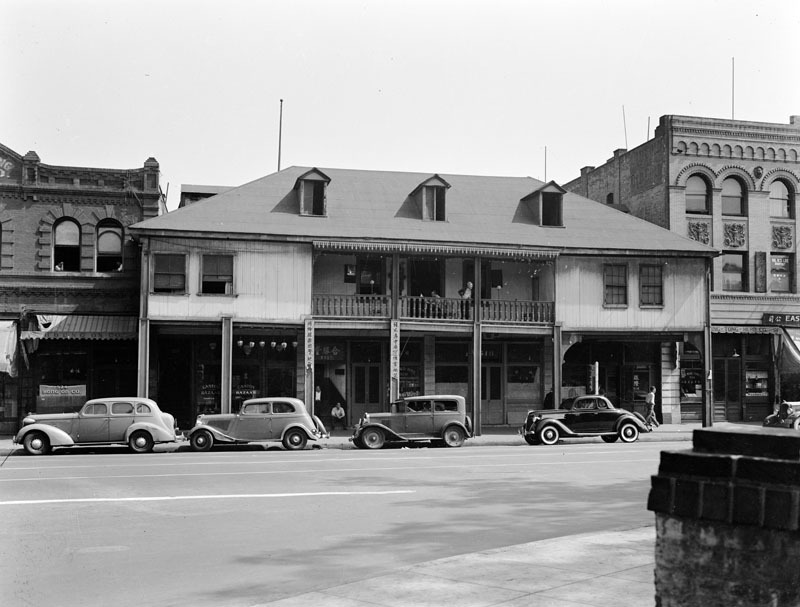 1920)* - The Pico House, sometimes called "Old Pico House." 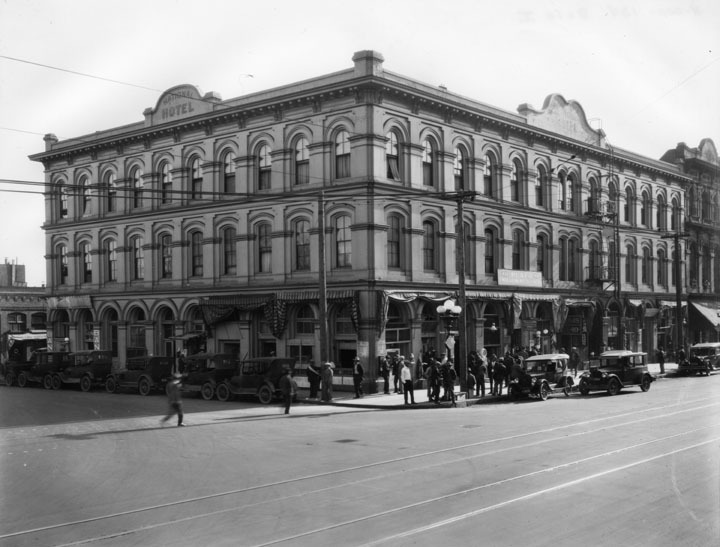 For a period in the 1920's it became the "National Hotel" and here we see a corner view of the building at the corner of N. Main & Plaza St., with a sign for "Plaza Employment Agency" on the right side of the building. A crowd of people are hanging around the corner, and a row of cars is parked up the left side, while 3 or 4 cars are seen on the right side. (ca. 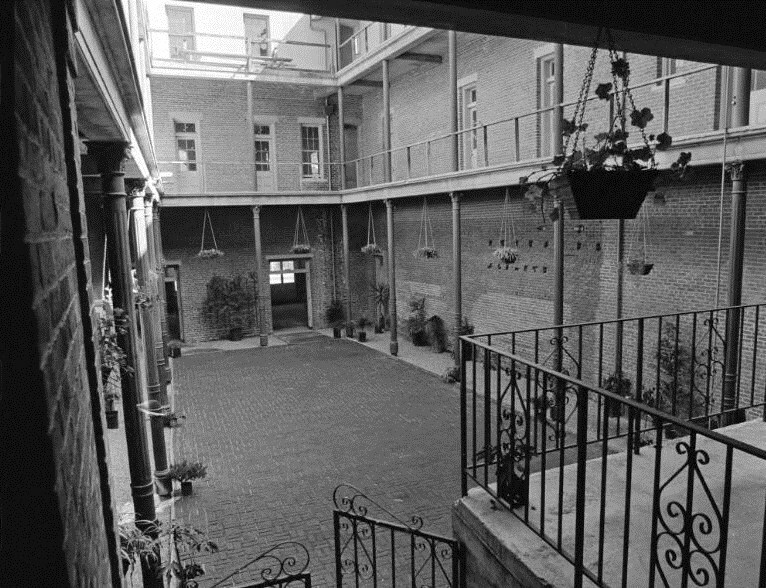 1971)***^ - View of the Pico House's interior courtyard shortly after it was restored. Known as the 'Oldest House in Hollywood,' this house was built in the 1870s by Eugene Raphael Plummer. 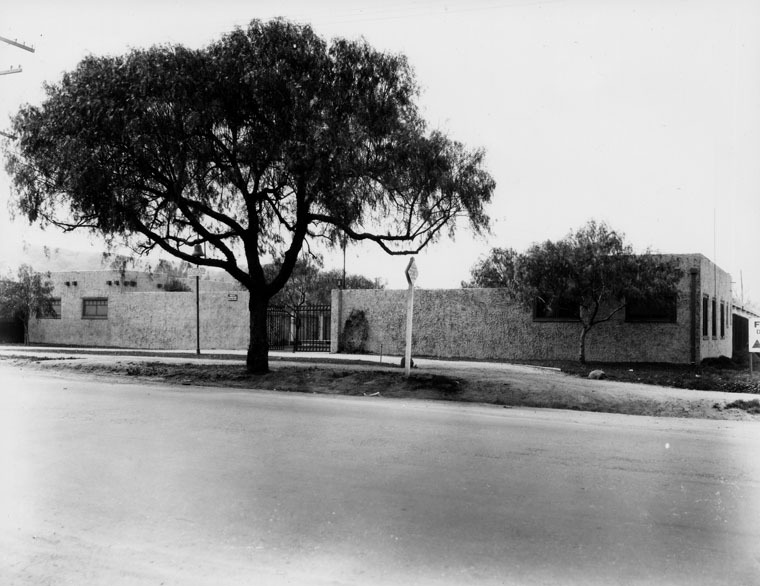 (1932)* - Almost hidden by the trees and shrubs in Plummer Park is a building indentified as the Plummer Ranch House. The house was located at 7377 Santa Monica Boulevard in West Hollywood until it was relocated in 1983 to the Calabasas site of the Leone Adobe. Location: Old location: 7377 Santa Monica Blvd, Hollywood (Los Angeles) New location: 23537 Calabasas Rd, Calabasas. Francisco López made California's first authenticated gold discovery on March 9, 1842. While gathering wild onions near an oak tree in Placerita Canyon he found gold particles clinging to the roots of the bulbs. The San Fernando placers and nearby San Feliciano Canyon were worked by Sonoran miners using panning, sluicing and dry washing methods. Lopez's find predated James Marshall strike at Sutter's Mill by six years. (n.d.)^^ - In 1842, Francisco López discovered gold next to this oak tree in Placerita Canyon, sparking a gold rush to the San Gabriel Mountains. 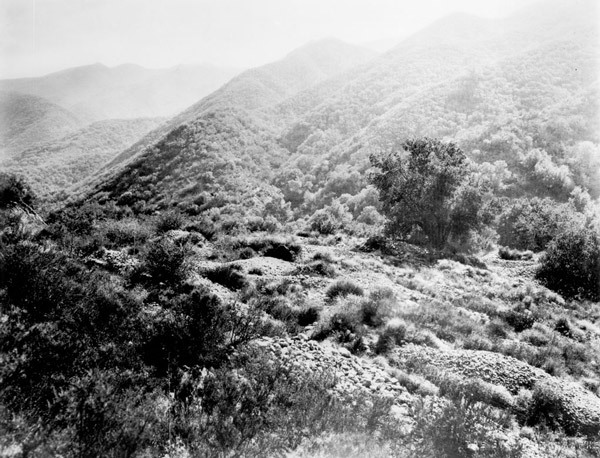 (1937)* - The spot in Placerita Canyon (Los Angeles County) where gold was first discovered in Southern California. "Under the tree gold was first found on the roots of wild onions." Location: Site: Placerita Canyon State and County Park, Placerita Canyon Rd, 4.6 mi NE of Newhall (Los Angeles); Plaque: SE corner I-5 and Lyons Ave, Newhall. Established in 1862, Drum Barracks became the United States military headquarters for Southern California, Arizona, and New Mexico. It was a garrison and base for supplies, and a terminus for camel pack trains operated by the Army until 1863. Abandoned in 1866, the site remains a landmark of the Civil War in California. (ca. 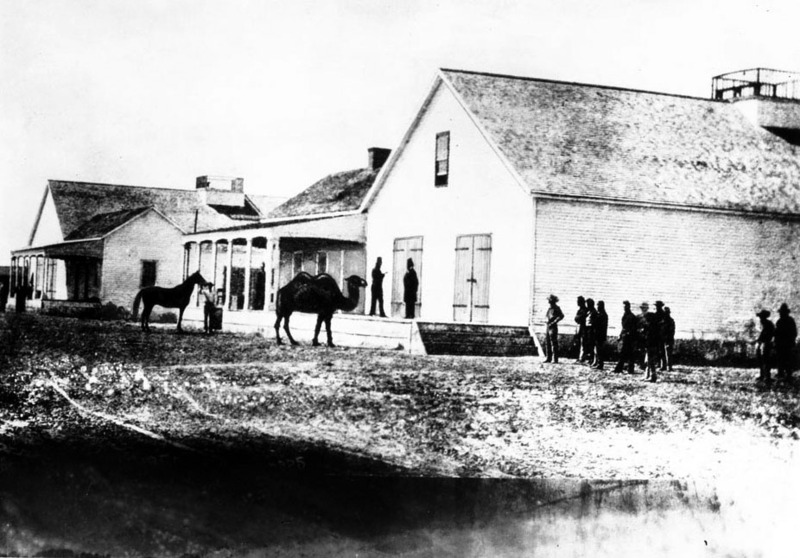 1865)^^ - Drum Barracks Warehouse with Camel in front ready for loading for trip to Arizona fort. (1889)* - Fort Drum Barracks (also possibly called Camp Burnside) encampment lasted from Aug. 10th to 19th, 1889. (Penciled on photograph are dates: 1861-1862) Photograph shows Commander Mudge, Adj't Myron F. Tarbel, comrade W. Savage among other uniformed men and women. 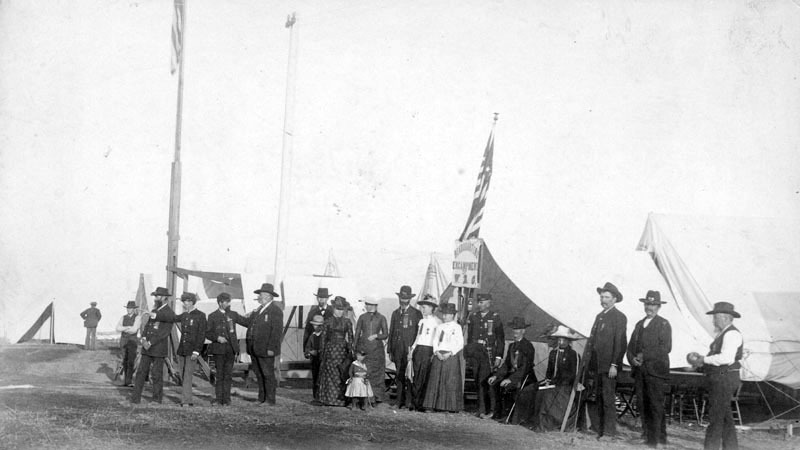 Sign with a mounted flag reads: Headquarters encampment of W.R.C. Location: 1053 Cary St (corner Cary and Opp), Wilmington. Camp Drum and Drum Barracks get their name from Col. Richard Coulter Drum, then Assistant Adjutant General of the Army's Department of the Pacific, stationed in San Francisco, and not after a percussion instrument. There is no record that Col. Drum ever saw or set foot in the station bearing his name. Click HERE to see more in Early Views of San Pedro and Wilmington. (ca. 1920)* - Fort Drum Barracks at Wilmington, which was built during the Civil War, 1051-1055 Cary Avenue. The bones of thousands of prehistoric animals that had been entrapped during the Ice Age in pools of tar that bubbled from beneath the ground were exhumed from this site. 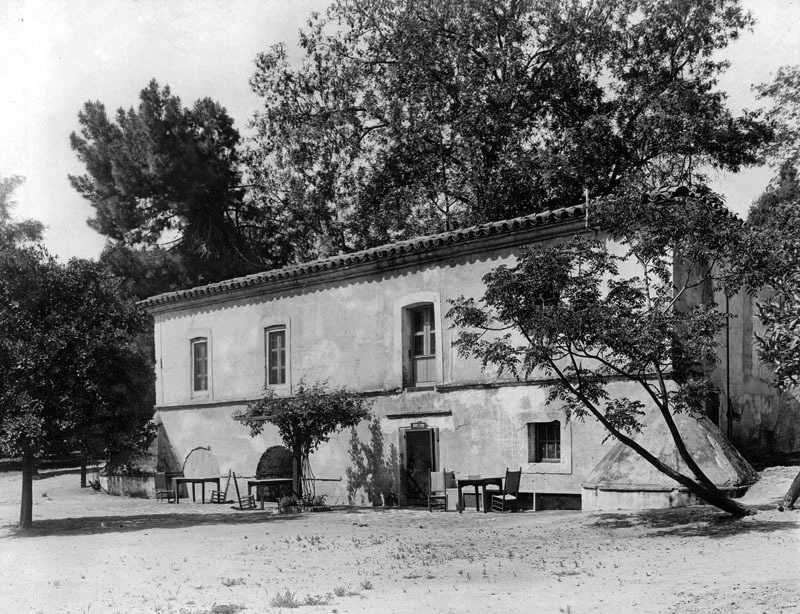 First historic reference to the pools, part of the 1840 Rancho La Brea land grant, was recorded by Gaspar de Portolá in 1769 - first scientific excavations were made by the University of California in 1906. The site was presented to the County of Los Angeles in 1916 by Captain G. Allan Hancock to be developed as a scientific monument. (ca. 1910)* - Standing on the edge of a small pond tar we can look across it to the old Hancock Ranch House. Off to the left in the distance are the oil fields. Beyond lay the Hancock Oil fields and the Hollywood Hills. 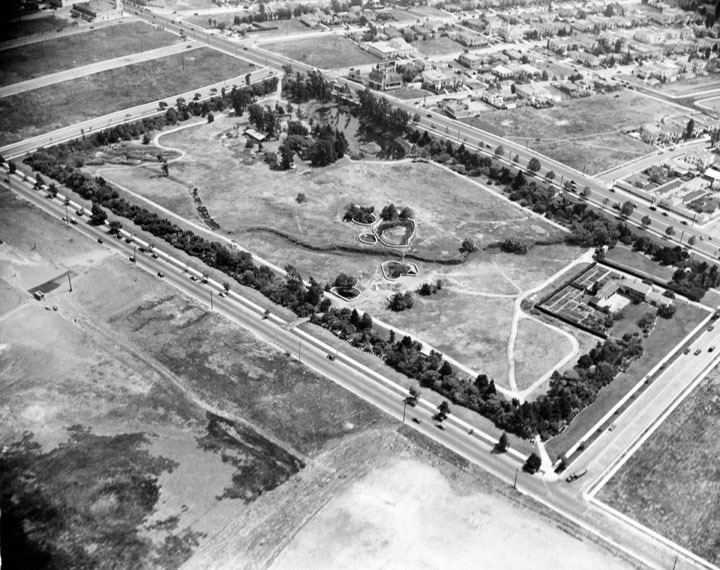 (1924)* - Aerial view of La Brea Tar Pits in Hancock Park. Location: Hancock Park, 5801 Wilshire Blvd between Ogden and Curson Streets, Los Angeles. 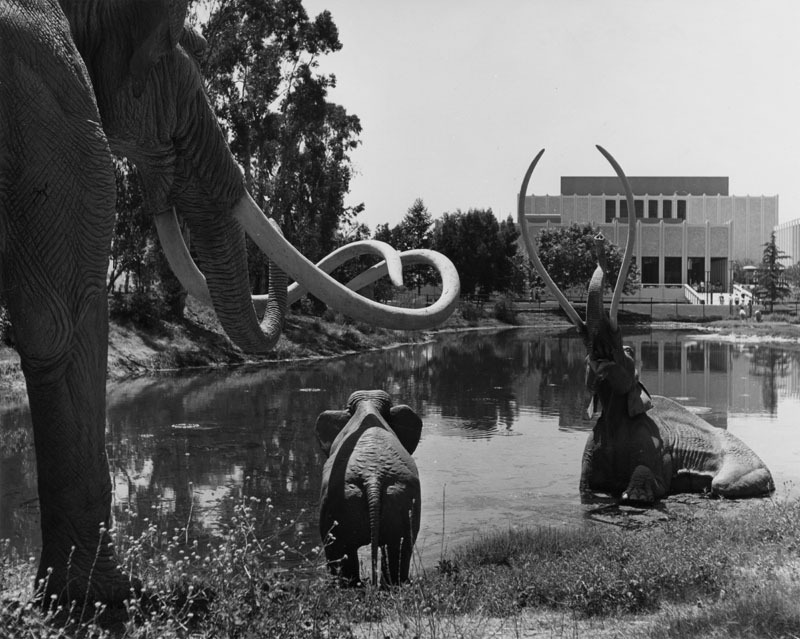 (1968)* - Three life-sized replicas of giant Imperial Mammoths, sculpted by artist Howard Ball, are shown on the shore at the tar pits adjacent to the Los Angeles County Museum of Art, present in the background. 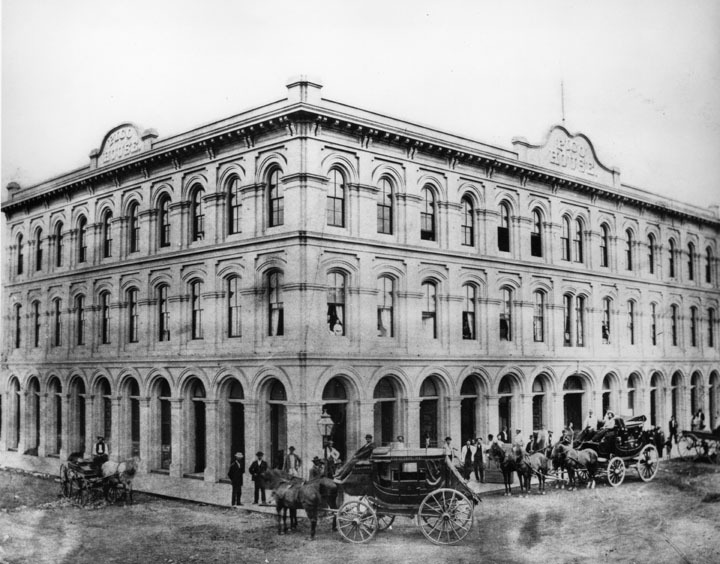 The Merced Theatre, erected in 1870 on North Main Street next to the Pico House, was the first building built expressly for theatrical purposes in Los Angeles. It was built by William Abbot, a cabinetmaker, and named in honor of his wife Merced Garcia. (ca. 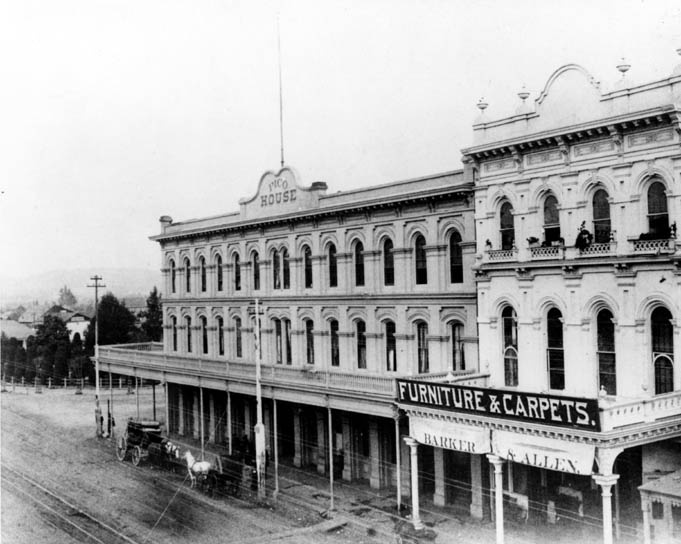 1876)* - Main Street and Plaza showing the Pico House and the Merced Theater. 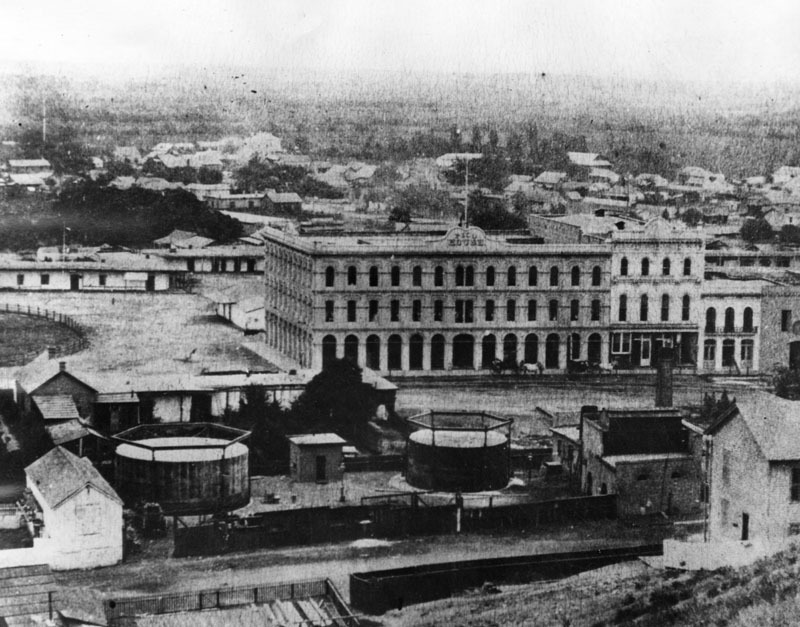 The first gas works can also be seen in the foreground; the tanks were built in 1867, the Pico House and the Merced Theater in 1870. 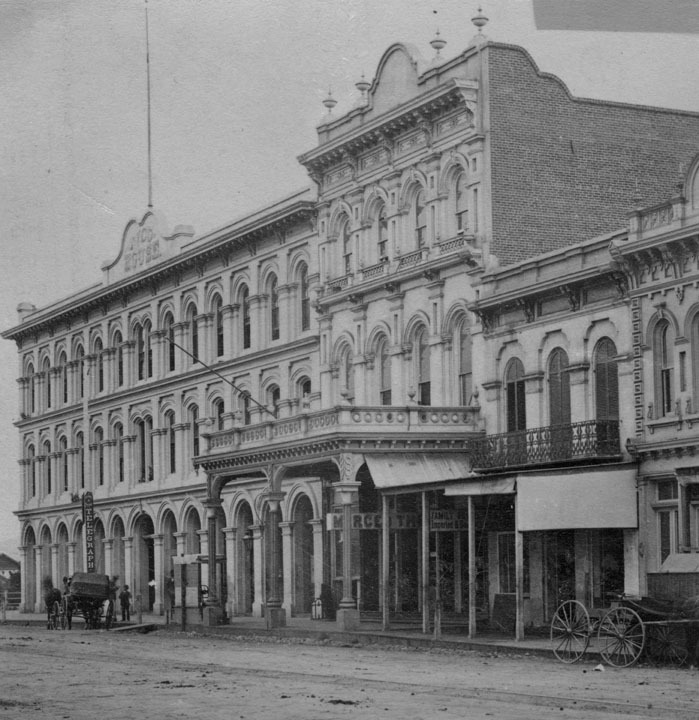 (1870s)* - The Merced Theater sits between the Pico House , and two other unidentified buildings close to the right. This was the "first business block on Main Street". 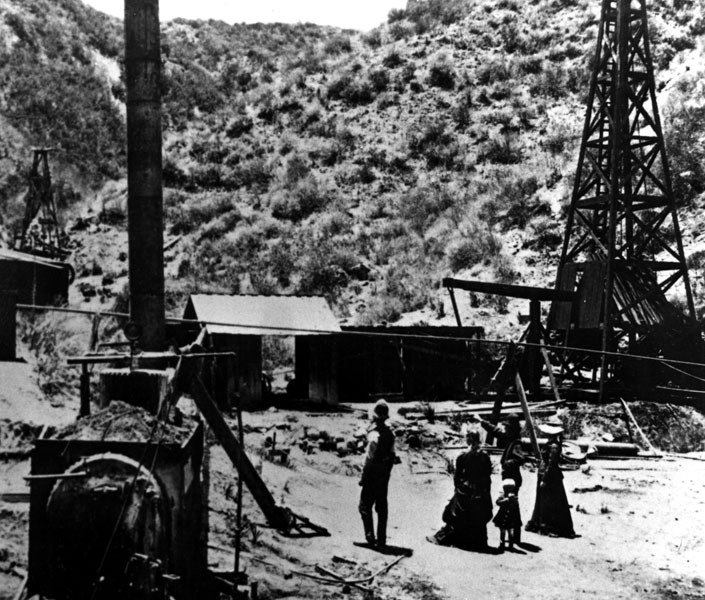 In 1875 the Star Oil Company, one of the predecessors of the Standard Oil Company of California, drilled its first Pico Canyon well, which yielded about one hundred barrels per day. The discovery resulted in the erection of the first commercial oil refinery in California the following year. 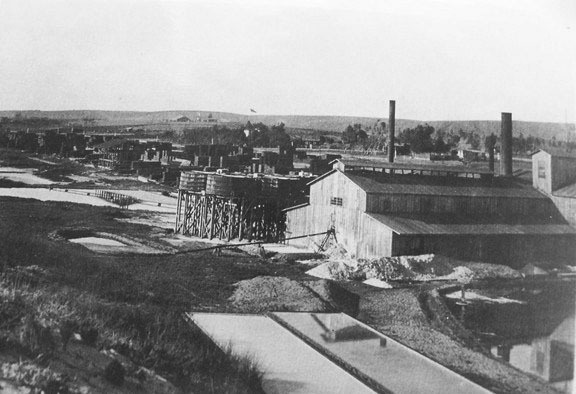 (1878)* - View of the Pioneer Oil Refinery, located in Newhall of the Santa Clarita Valley, which operated from 1876 to about 1888. Located on Pine Street in Newhall, the refinery dates back to approximately 1876, when driller Alex Mentry broke ground in Pico Canyon and Chinese track layers were hammering rails through Henry Newhall's recently-purchased rancho. The little 15-barrel still that had been erected in 1874 at Lyon's Station (now Eternal Valley Cemetery) just wasn't working out. It couldn't produce a smoke-free kerosene -- oil's major use in those days -- and in 1875 it was shut. Besides, it was almost a mile away from the coming railroad. Location: Site and private plaque at 238 Pine St, Newhall - state plaque at Lang Blvd exit of I-5. (1895)^^ - Photographic portrait of Charels and Nellie Bogue in front of the former home of Tomas Sanchez in Glendale, 1895. The one-story adobe, located on the back of the Verdugo Ranch one half-mile west of Brand Boulevard, is shown at center, featuring a wrap-around patio and overhang. In the yard in front, Charles is shown seated to the left with Nellie standing at his side. Grown in the picture, they are the children of C.V. Bogue. At center, three boys in bolero dress identified as the children of "Charles and John" sit astride a burro while two girls identified as "Ruth and Helen" are pictured in lightly colored dressed farther left. The yard appears to be overgrown with sedgegrass. Sanchez lived at the residence between 1872 and 1875. 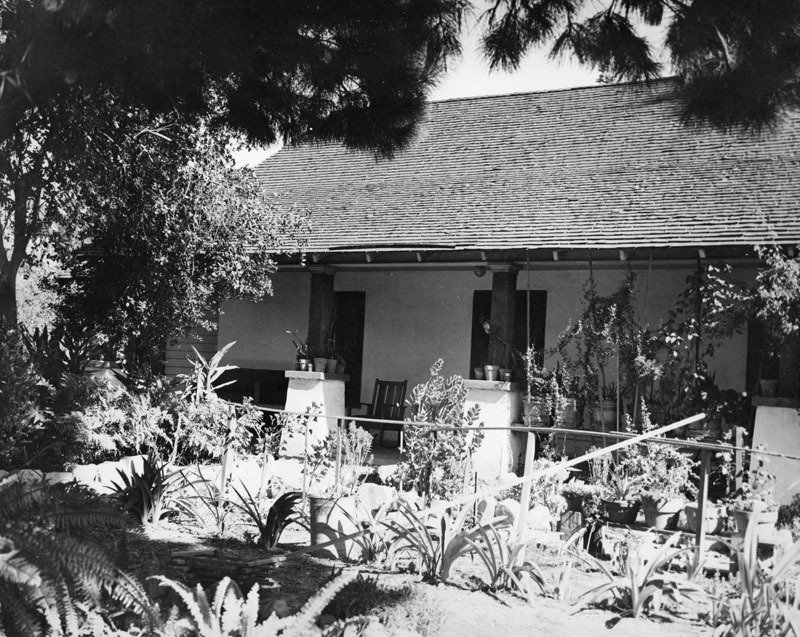 (1936)* - Exterior view of the Tomas Sanchez adobe, La Casa Adobe de San Rafael, Glendale, in June 1936, following restoration in 1932. The photo shows its Monterey-style corridor (covered porch). It was built by Tomas Sanchez, sheriff of L.A. County, in 1849 on Rancho San Rafael land owned by Fernando and Rafaela Verdugo. It stands in a city park and is now furnished with furniture, cooking utensils and other relics of its time. Location:1330 Dorothy Dr, Glendale. (ca. 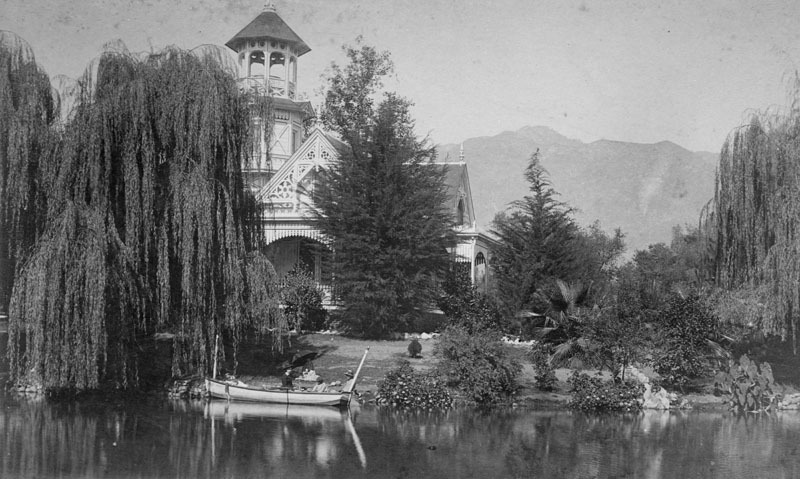 1889)* - Exterior view of Ayer Cottage, the original home of Pomona College when it was located in Pomona. The rented cottage had four rooms where the College held its first classes in 1888 in exercise of its charter granted October 14, 1887. 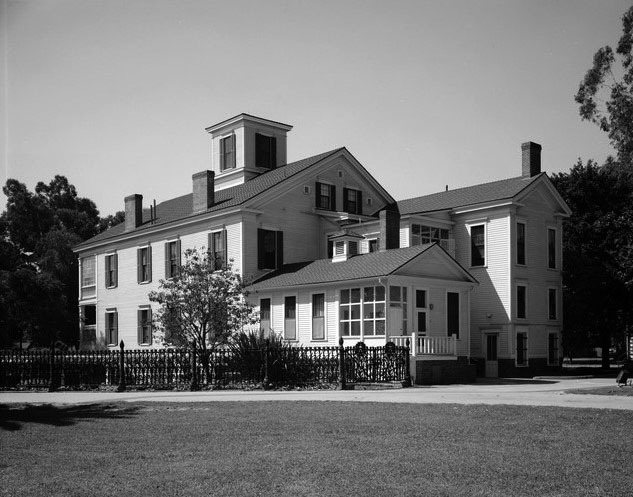 About six months later the campus moved to Claremont after an unfinished hotel in Claremont, along with adjacent land, was given to the College. Location: SW corner Mission Blvd and S White St, Pomona. 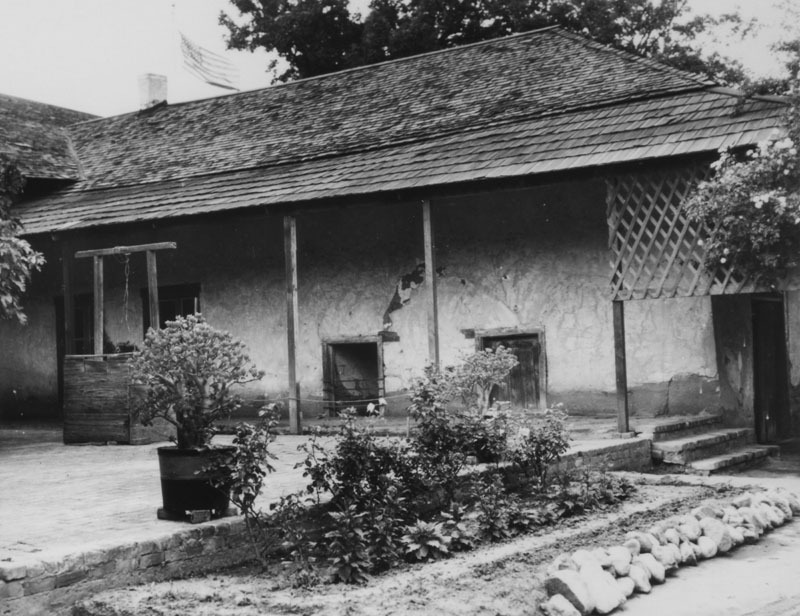 The Lugo Adobe, said to have been built in the 1840s by Don Vicente Lugo, was one of the very few two-story houses in the pueblo of Los Angeles. In 1867, Lugo donated this house on the Plaza to St. Vincent's School (forerunner of Loyola University). From the 1880s until it was razed in 1951, the building was occupied by the Chinese. 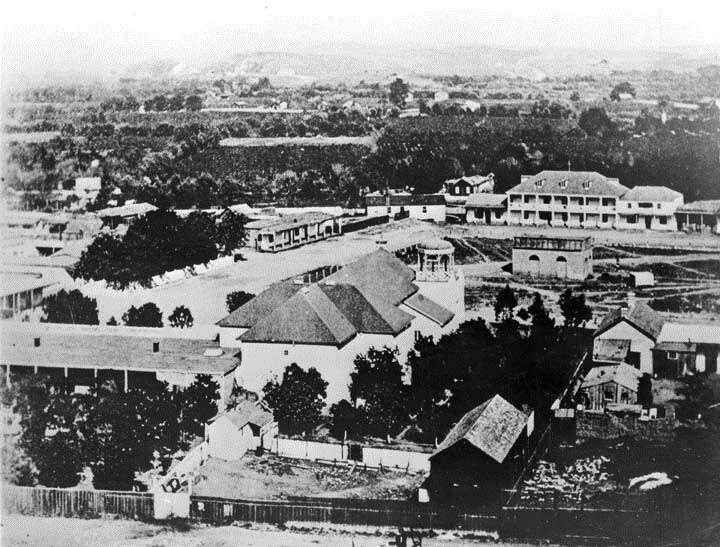 (1865)* - The Plaza, looking east, with LA's first above ground reservoir to the right of the picture. The two-story building directly behind the reservoir is the Vicente Lugo adobe house. The building in front of the reservoir with the gazebo-like tower is the 'Old Plaza Church'. Click HERE to see more in Early Views of the L.A. Plaza. (1890)* - The Los Angeles Plaza, around 1890. The one story building on the left is the former residence of Don Augustin Olvera. The large two story on the right is the former residence of Don Vicente Lugo. The LA City Water Company is at the northwest corner of Marchessault and North Alameda. Some of the area shown is now occupied by the Union Terminal. (ca. 1890s)** - Exterior front view of the two-story Vicente Lugo adobe house, seen with hipped roof and dormer windows. The home is on S/E corner of Los Angeles and Alameda Streets, and faces the Plaza. 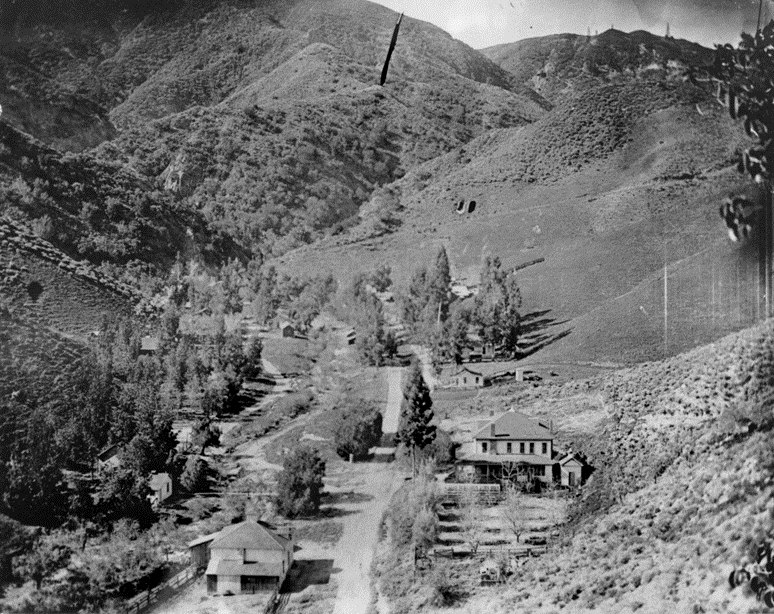 When this photograph was taken, the adobe was home to Leeching Hung & Co., with adjacent buildings flanking it on either side; horse-drawn carriages are parked on the unpaved road in front of the buildings. 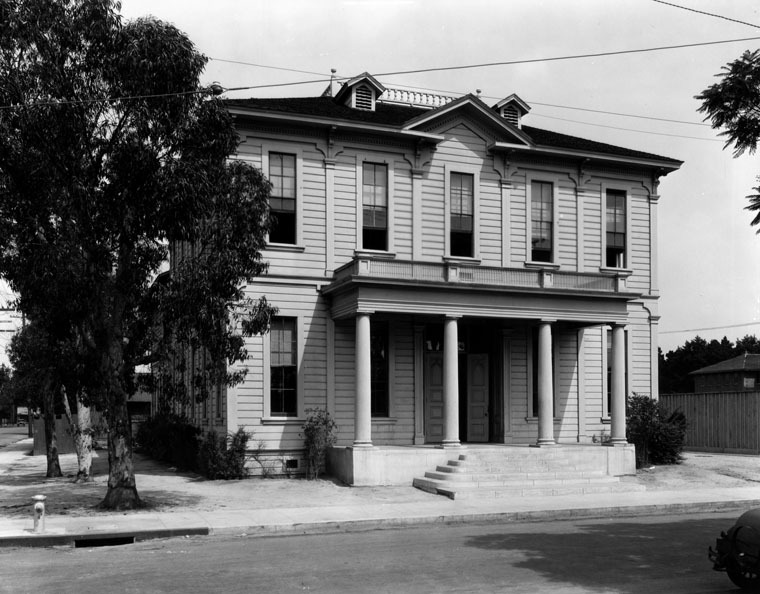 (1939)* - Exterior front view of the two-story Vincent Lugo adobe house, located on Los Angeles Street and facing the Plaza. It is now flanked by brick buildings, with cars parked on the street in front. Location: El Pueblo de Los Angeles Historic Monument, SE corner Los Angeles and Alameda Sts, Los Angeles. The Old Mill, El Molino Viejo, was designed by Father José María Zalvidea and built of fired bricks and adobe about 1816 to serve Mission San Gabriel. Another grist mill was built in 1823 near the mission and the old mill was gradually abandoned - it passed from mission control in 1846. The property remained in private hands until 1903, when Henry E. Huntington bought the building and used it for a golf clubhouse. Later owners, Mr. and Mrs. James Brehm, had the mill restored in 1928 by Frederick Rupple. (ca. late 1800s)^^# - View of the entrance to the Old Mission Mill adobe. The old mill built by the fathers of Mission San Gabriel Arcangel. (ca. 1890)* - View of the Old Mission Hill after it moved from mission control to private hands and remodeled. The photograph was taken between 1881 and 1895. View is from the side, with trees in the foreground. (ca. 1910)^^# - Exterior view of the Old Mission Mill, used by Henry E. Huntington as a golf clubhouse after he purchased it in 1903. Location: 1120 Old Mill Rd, San Marino. The oldest portion of the adobe was built about 1834 by ex-mission Indians. It was enlarged by Eulogio de Celís in 1846, and an upper story added by Rómulo Pico in 1874. The house was restored by Mr. and Mrs. M. R. Harrington in 1930. (ca. 1876)++ – View showing Rómulo Pico standing in front of his home. Rómulo was the son of Andrés Pico, and he lived here with his wife Catarina (Rómulo is at right). (ca. 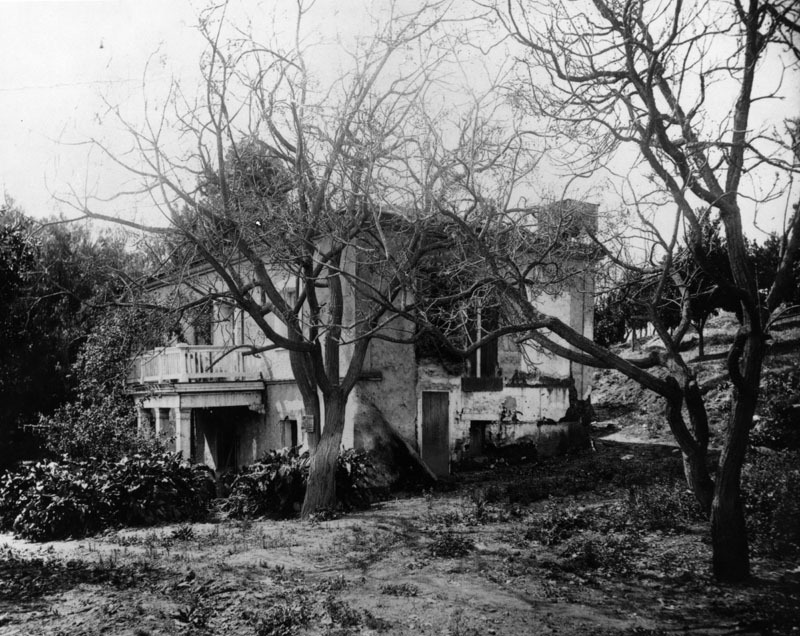 1920)^# - Exterior view of the home of Andres Pico (brother of Pio Pico) located near the San Fernando Mission at 10940 Sepulveda Boulevard in Mission Hills. Click HERE to see more in Early Views of the San Fernando Mission. 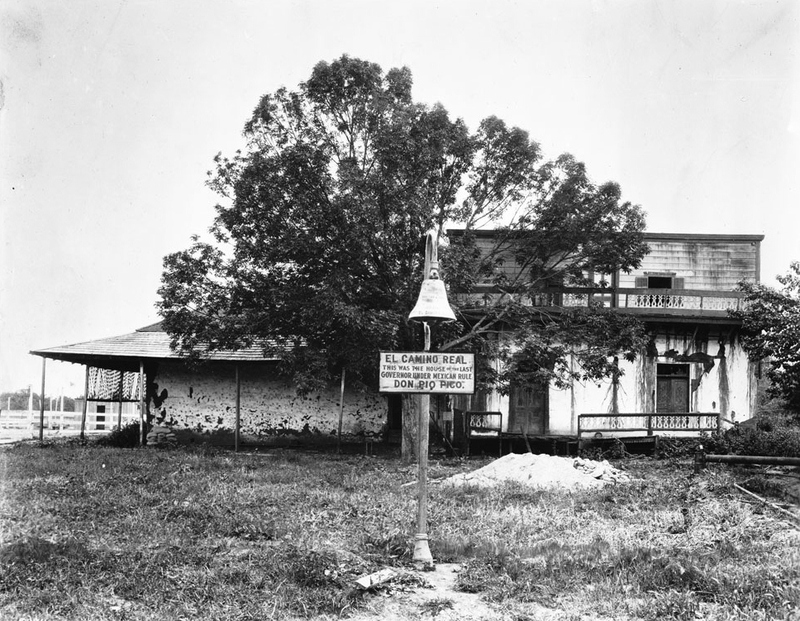 (1927)^# - The Andres Pico Adobe (also known as Romulo Pico Adobe) before its restoration. The artist in the foreground is Claude A. Whisman, a Los Angeles police officer, who was recovering from a gun shot wound. His painting is on display in the Adobe. 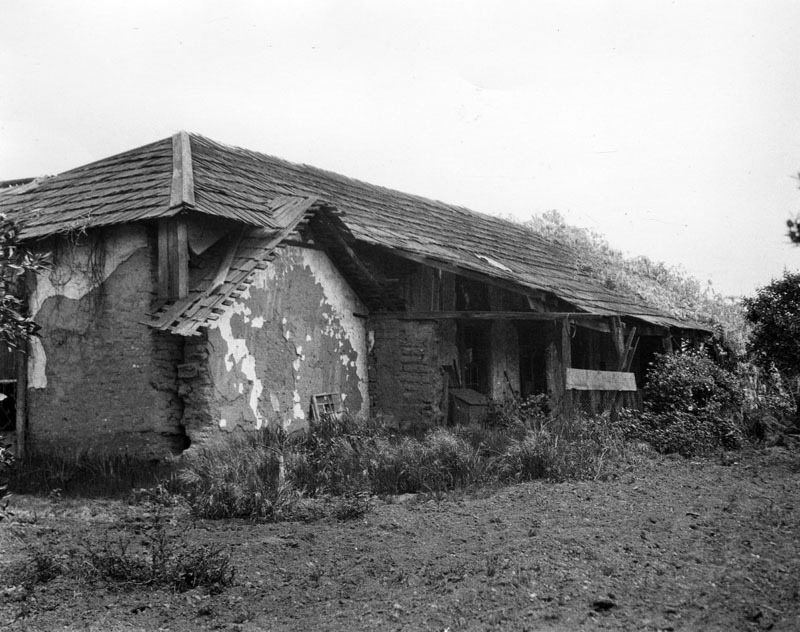 (1966)* - The 'Rancho Romulo,' one of oldest houses in the southland. Location: 10940 N Sepulveda Blvd, Mission Hills. Also listed on the National Register of Historic Places: NPS-66000211. 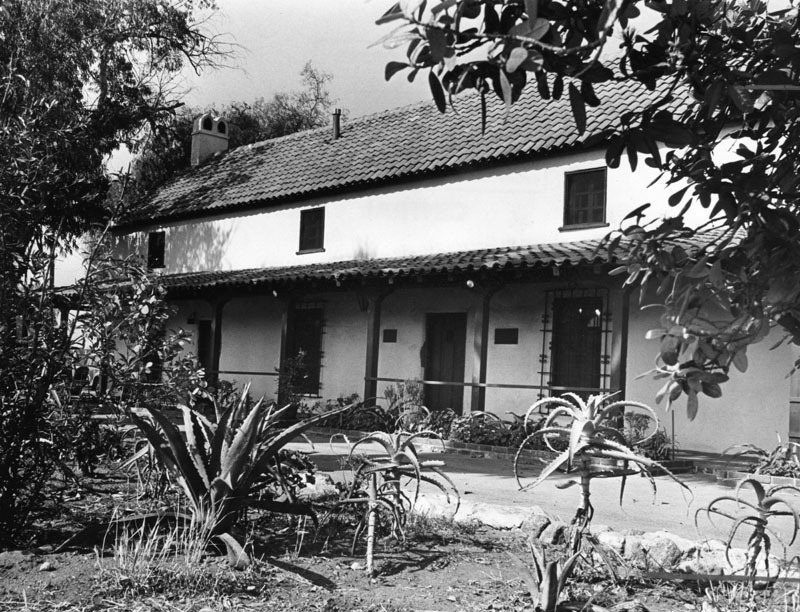 In 1962, the Romulo Pico Adobe (Rancho Romulo) was dedicated as Los Angeles Historic-Cultural Monument No. 7 (Click HERE to see complete listing). Bubbling springs once flowed here from their source in a deep water basin that has existed continuously since the Pleistocene Era. Prehistoric animals, Indians, and early Inglewood settlers were attracted here by the pure artesian water. The springs and valley were named after sentinels guarding cattle in the area. (n.d.)* - A concrete fountain is the site of Aguaje de la Centinela, or Centinela Springs. The inscription on the fountain reads "Since time immemorial, God's blessing of sweet water to all his creatures." The Centinela Springs Park is visible in the background. Location: Centinela Park, 700 Warren Ln, Inglewood. (n.d.)* - Exterior view of the Baldwin Cottage, also known as the Queen Anne Cottage. Built between the years 1885-86 by Elias Jackson "Lucky" Baldwin, it is believed to have been a honeymoon gift for Lucky's fourth wife, sixteen year-old Lillie Bennett. Lillie's father, architect Albert A. Bennett, designed the cottage. After the May-December marriage ended in 1885, Baldwin converted the home into a memorial to the third wife, Jennie Dexter, who had died in 1881. Jennie's likeness can be seen in a stained glass portrait in the front door and in a large portrait hanging in the parlor, both of which remain in the cottage today. 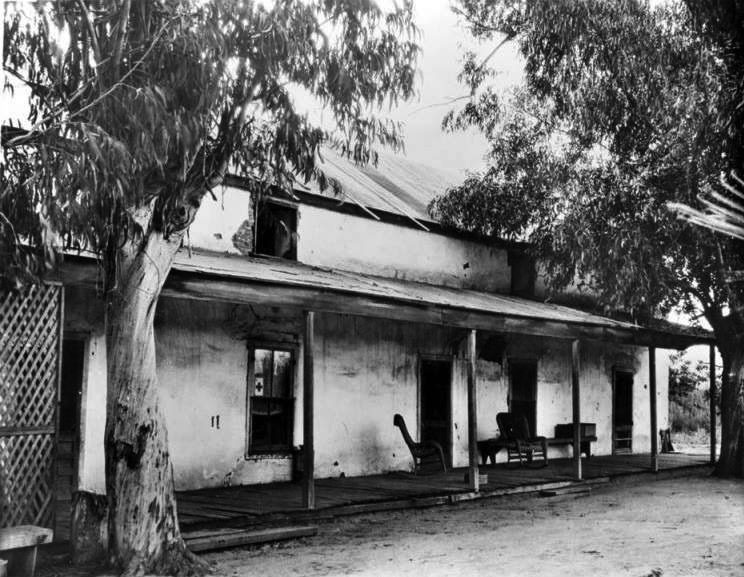 Baldwin resided in the neighboring 8-room adobe house, originally owned by Hugo Reid, leaving the cottage to serve as the ranch guest house. After Baldwin's death in 1909, the ranch land fell into the hands of Baldwin's daughter Anita, who in 1936, sold some acres to Harry Chandler of the Los Angeles Times. Chandler owned a real estate company, Rancho Santa Anita, Inc., which oversaw the former Baldwin land and developed subdivisions in the area. In 1947, 111 acres of the former Santa Anita Ranch were purchased from Rancho Santa Anita, Inc. by the State of California and County of Los Angeles to develop the arboretum. Location: Los Angeles State and County Arboretum, 301 N Baldwin, Arcadia. Hugo Reid, a Scotsman, petitioned the government of Mexico to grant him Rancho Santa Anita. His claim strengthened by his marriage to Victoria, a native Indian of the San Gabriel Mission, he received the grant on April 16, 1841. 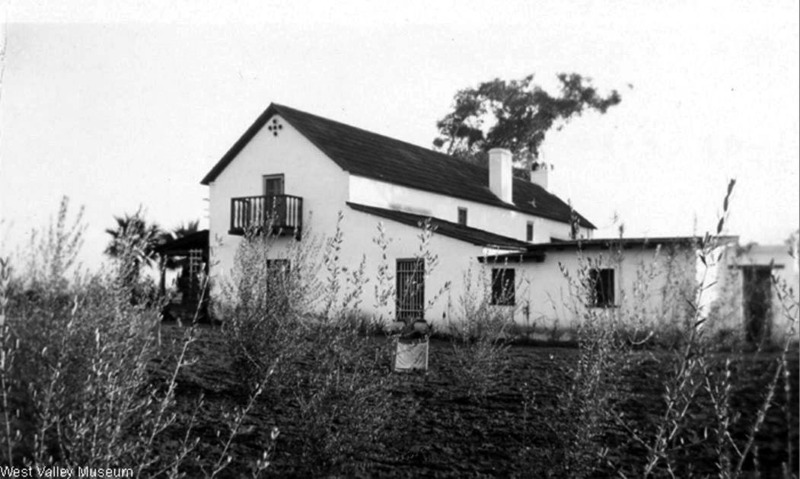 Immediately upon filing his petition, Reid took possession of the land, started to farm and plant vineyards, and built the first house-the Hugo Reid Adobe-in 1839. 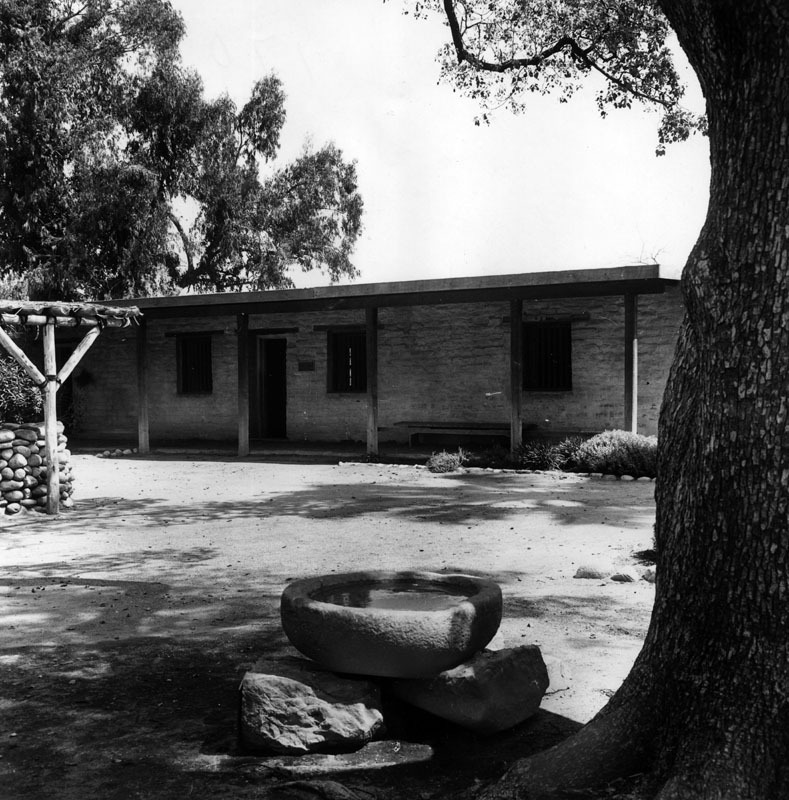 In 1875, E. J. Baldwin purchased the rancho and in 1879 added a wooden wing to the old adobe. 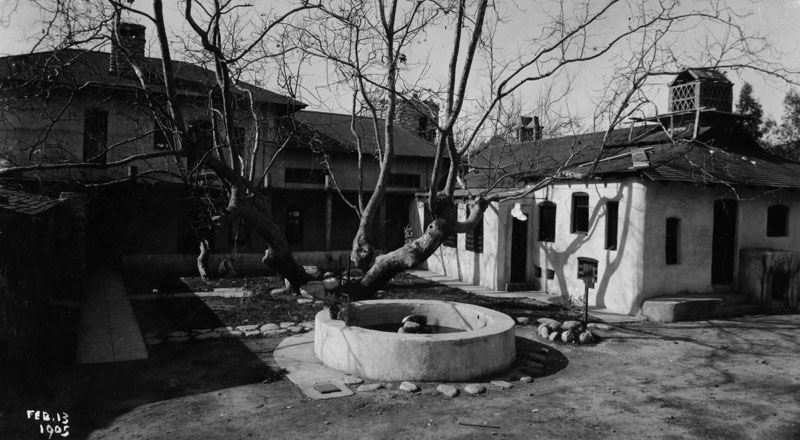 (1964)* - Courtyard view of Hugo and Victoria Reid's adobe at the Arboretum. Well is at the left and rocks at right are believed to be the original baptismal font from one of the early California missions. The ranch was owned by E. J. "Lucky" Baldwin from 1875 to 1909. Location: Los Angeles State and County Arboretum, 301 N Baldwin Ave, Arcadia. Completed about 1854 and restored in 1939, this was the family home of Don Ygnacio Palomares. Governor Juan B. Alvarado granted Rancho San Jose to Don Ygnacio and Don Ricardo Vejar in 1837. 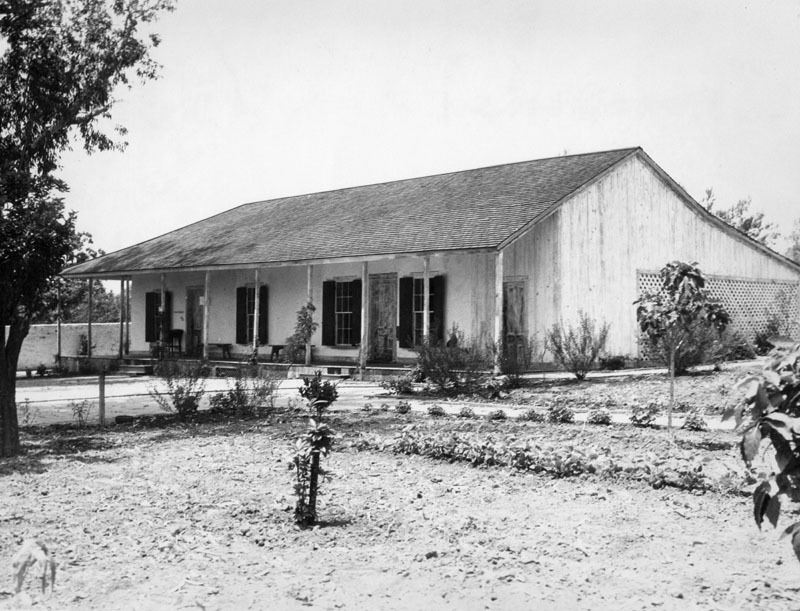 (Late 1800s)* - Exterior view of Adobe de Palomares, the ranch home of Don Ygnacio Palomares and his wife Doña Concepción López de Palomares, located on the grounds of Rancho San José. Photograph shows a portion of the adobe, which had since fallen into ruins. Don Ygnacio was one of the first Pomona Valley settlers in 1837 and owned, along with the Vejar family, the Rancho San José, which covered eastern Los Angeles County. Location: 491 E Arrow Hwy, Pomona. The Indians of this area obtained salt from this lake. Sometime in the 1850s, Johnson and Allanson erected the necessary works to manufacture salt by artificial as well as solar evaporation. The salt yield for 1879 was 450 tons. This photo shows the abandoned salt works, and is variously dated as 1895, 1904, and 1906.^^* Location: SE corner Harbor Dr and Yacht Club Way, Redondo Beach. This adobe home, built by Diego Sepúlveda in the 1850s, was the first two-story Monterey-type adobe built in Southern California. (n.d.)* - Exterior view of a two-story adobe home of Don Diego Sepulveda, erected in 1853. Location: 700 block of Channel St, San Pedro. The whaling industry is said to have been started by Captain Clark in 1864. 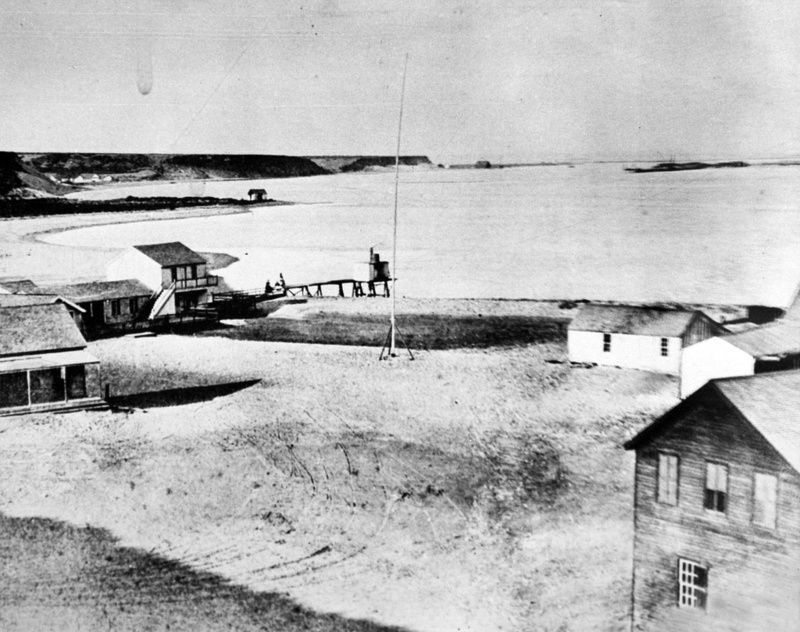 Captain Frank Anderson, a Portuguese, tried 2,166 barrels of whale oil at this station from 1874 to 1877. 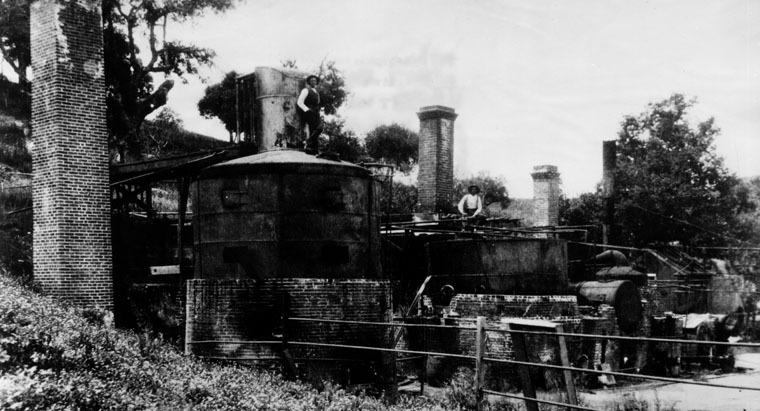 The station was abandoned because of a lack of fuel rather than vessels. 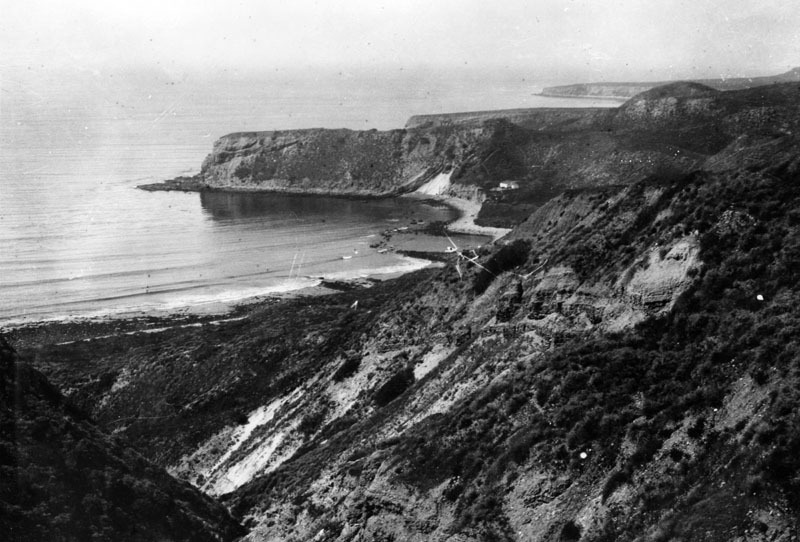 (Early 1900s)* - Panoramic view showing the coast of the Palos Verdes Peninsula. Portuguese Bend, in Rancho Palos Verdes, is seen in the foreground. The name Portuguese Bend comes from the whaling activities of Portuguese whalemen from the Azores. An Azorean shore whaling captain named José Machado brought shore whaling to this bend in the coastline north of San Pedro Bay after the closure of the San Pedro Bay whaling station on Deadman's Island in or about 1862. He brought with him a crew of Azorean whalemen. In 1864, Captain Clark moved his operations to San Simeon Bay. In 1869, the station was operated by the John Brown Whaling Company (Los Angeles Star, March 13, 1869). 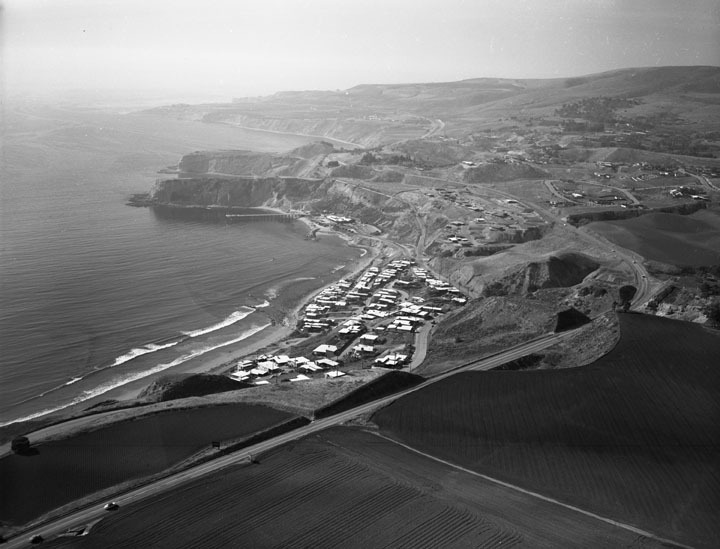 (1955)* - Aerial view of the Portuguese Bend Beach Club (along the bend) and Rancho Palos Verdes vicinity; view is looking southwest. Catalina Channel and the Pacific Ocean are visible on the left, and the hills fill the background toward the right. 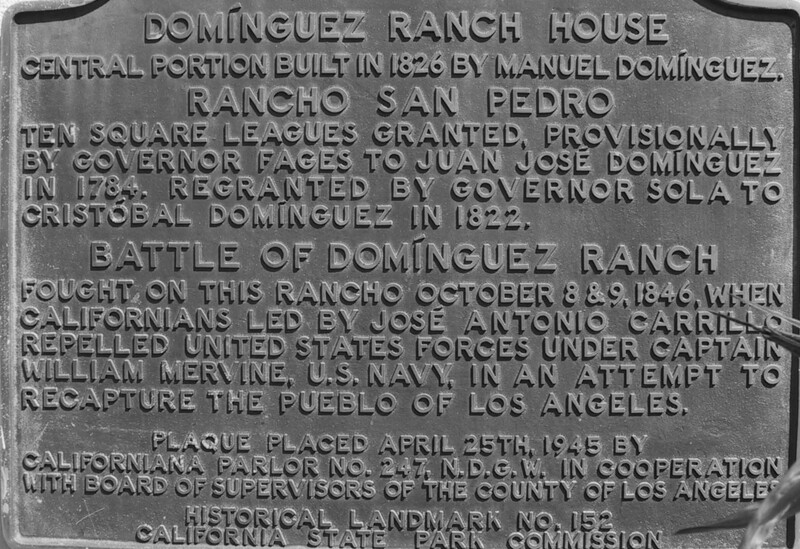 In 1846 Jose Dolores Sepulveda and José Loreto received a Mexican land grant from Alta Governor Pío Pico for a parcel from the huge original 1784 Spanish land grant Rancho San Pedro of Manuel Dominguez. 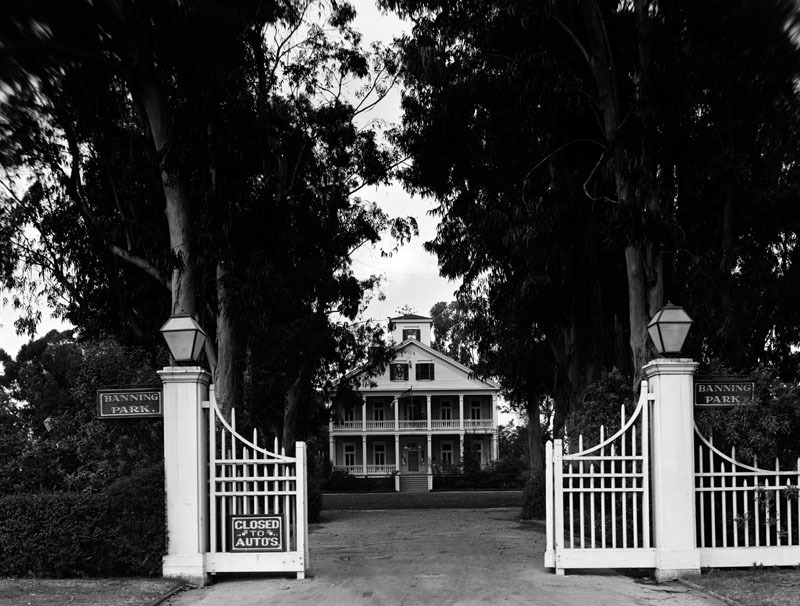 It was named Rancho de los Palos Verdes, or "ranch of the green sticks", which was used primarily as a cattle ranch. 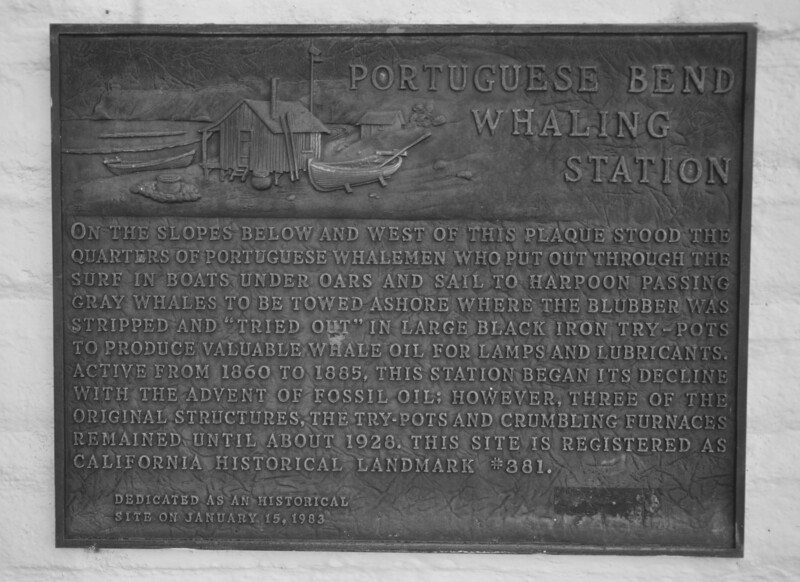 (2010)*^^ - Portuguese Bend Whaling Station Marker. Location: Portuguese Bend Club, Palos Verdes Dr. and Maritime Rd, Rancho Palos Verdes. This adobe was built in 1818. Dolores had trouble getting his land title cleared, so he took a trip to Monterey to get the matter definitely settled and, on his return trip, he was shot with an arrow by a hostile Indian at Mission La Purísima Concepción. (n.d.)* - An adobe in Sawtelle built circa 1880 by Dolores Sepulveda on what was once part of Rancho San Vicente. 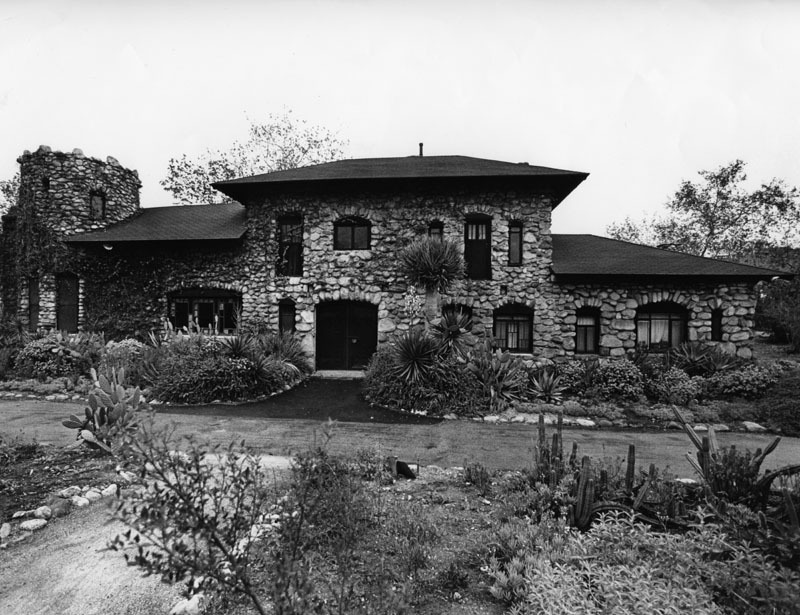 Located three blocks south of Bundy Drive, the adobe was occupied by a Japanese farmer in 1936. Date of original photo is unknown; copy made by WPA April 2, 1937. Location: Approx intersection of Madison St and Courtney Way, Torrance. In 1852 German immigrant Augustus W. Timms obtained Sepúlveda's Landing on the mudflats near here. He built a wharf, added a warehouse, corral and other facilities to service shipping and the running of stages to Los Angeles. Timms was a pioneer in the development of the harbor and for over fifty years this area was known as Timms Point. (ca. 1865)#* - At the south end of Los Angeles in the 1800s was a mudflat. 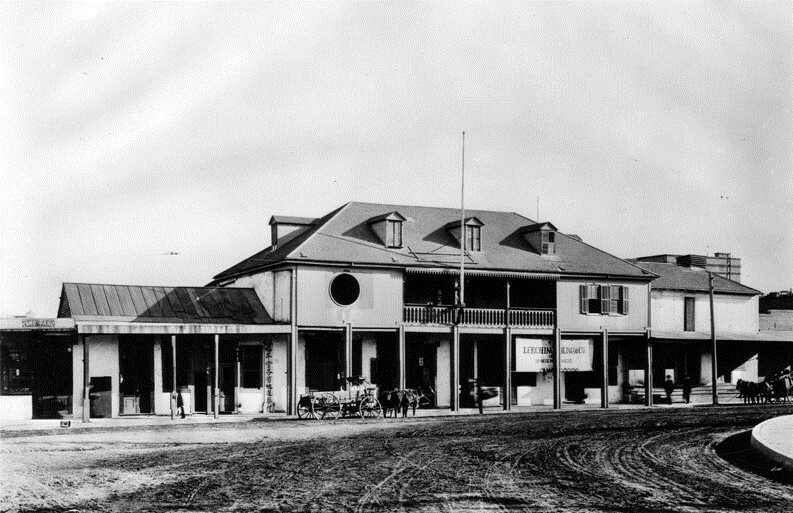 By 1868 it would be named Timms' Landing and some historians consider it the first Port of Los Angeles. Timms' Landing was surrounded by vast areas of tidal flats and marshes. (ca. 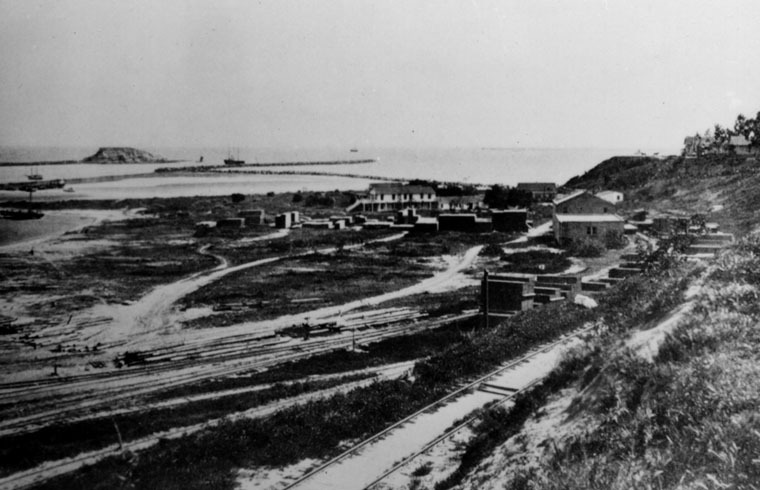 1870s)* - View of Timms' Point, Los Angeles Harbor. Breakwaters and Deadman's Island can be seen in the background. Deadman's Island was one of two islands near San Pedro in the 19th century. The land, sometimes referenced as Dead Man's Island, Isla Del Muerto, and Reservation Point, was dredged away in 1928 as part of a harbor development effort. Rattlesnake Island, the other islet in the area, became Terminal Island. Location: Sampson Way at Southern Pacific Slip, San Pedro. Near this site on January 8, 1847, American forces commanded by Captain Robert F. Stockton, U.S. Navy, Commander in Chief, and Brigadier General Stephen W. Kearney, U.S. Army, fought Californians commanded by General José María Flores in the Battle of the Río San Gabriel. (n.d.)* - Historical Landmark No. 385 commemorating the Battle of the Rio San Gabriel on January 8, 1847, near this site in Montebello. A cannon is seen. 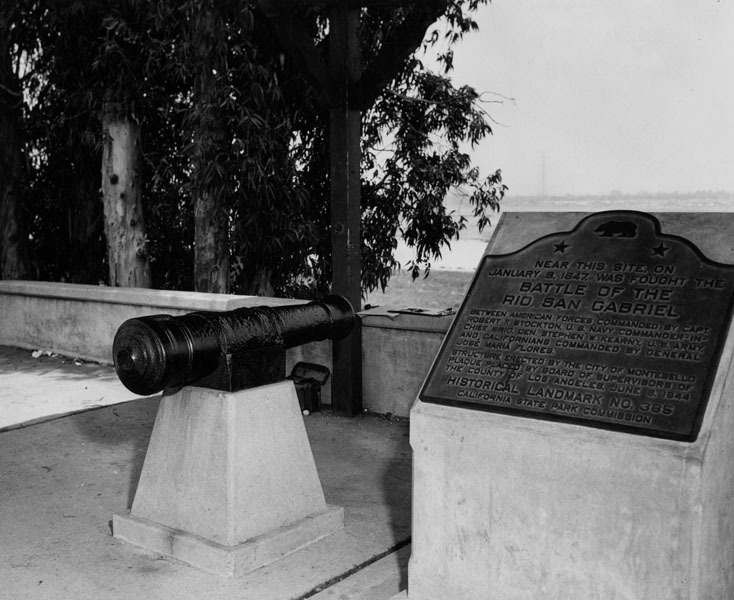 The monument is located at Washington Boulevard and the Rio Hondo River and was placed June 8, 1944, in memory of the battle between American forces commanded by Robert T. Stockton and Stephen W. Kearny and Californians commanded by General Jose Maria Flores. Location: NE corner of Washington Blvd and Bluff Rd, Montebello. This house, built in 1868 by Saturnino Carrión, was restored in 1951 by Paul E. Traweek. 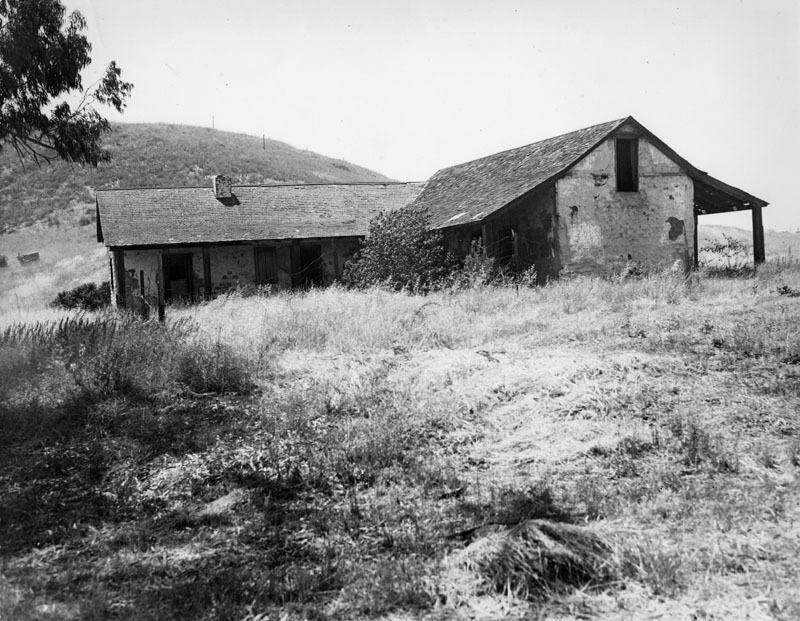 (1936)* - Adobe house of Saturnino Carrion built in 1868 located three miles southeast of San Dimas when the photograph was taken on June 24, 1936. 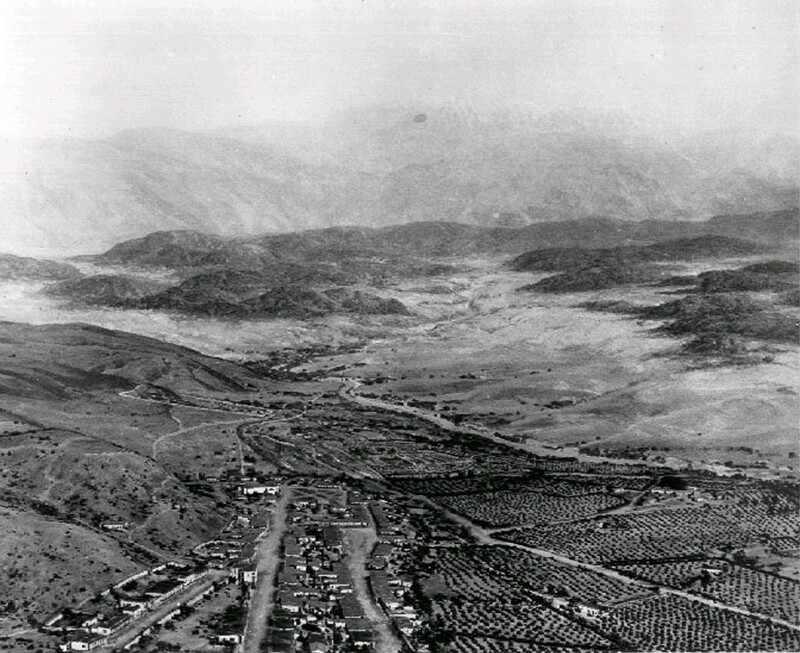 The area later became part of La Verne. Location: 919 Puddingstone Dr, La Verne. Erected during mission days, 1792-1805, this is the second oldest adobe in this region. Originally 'L'-shaped, it is now only half its original size. 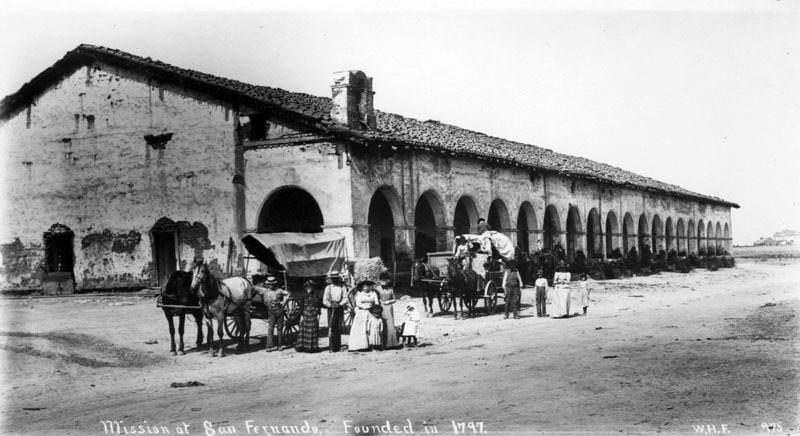 In 1859, the adobe became the property of Don Jean Vigare and in the early 1860s, as San Gabriel's first bakery, it was separated from the mission's lime orchard by a high cactus wall. 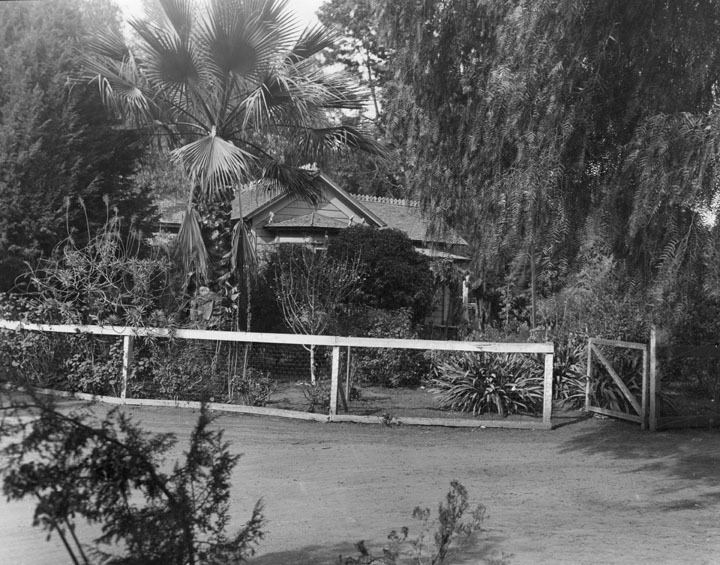 (1939)* - Exterior of the Ortega-Vigare Adobe. Mrs. Lux Vigare, great-granddaughter of a solidier of the Mission San Gabriel Archangel, was in residence at the time the photograph was taken on June 6, 1939. Location: 616 S Ramona St, San Gabriel. The first hydroelectric installation in California for long-distance transmission of alternating current at high voltage was built in 1892 on San Antonio Creek below this spot by the San Antonio Light and Power Company organized by Dr. Cyrus Grandison Baldwin, President of Pomona College. 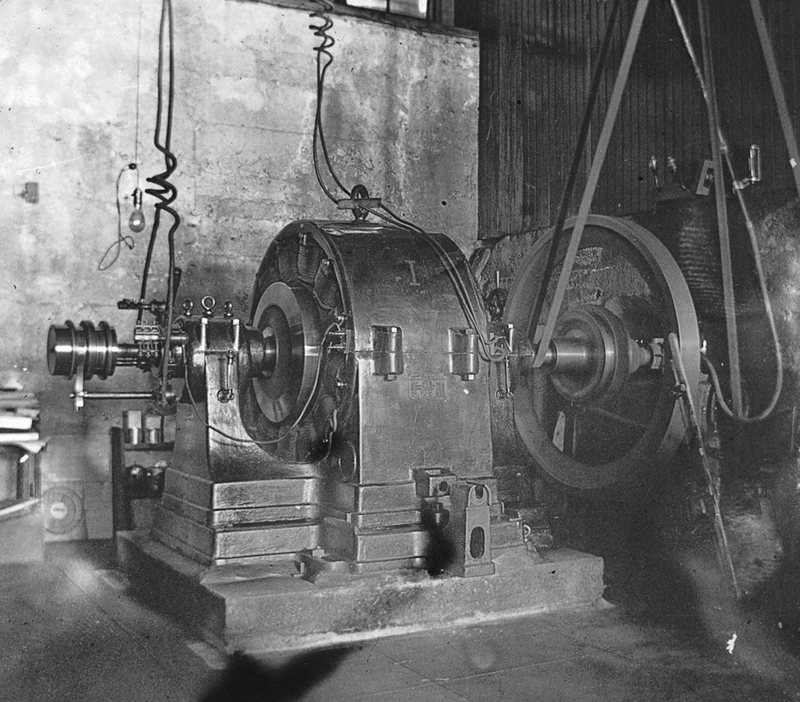 The first high-voltage transformers built by George Westinghouse for this installation provided for transmission of 10,000 volts from the plant to Pomona. (1956)*^* - The first hydroelectric plant in California was constructed near Pomona by the San Antonio Light and Power Corporation and put in operation in 1892. Electric energy was transmitted a distance of 28 miles at 10,000 volts. Location: Camp Baldy Rd (P.M. 2.0), San Antonio Canyon, 8.1 mi N of State Hwy 166, Claremont. On this site stands CSO-4 (Pico No. 4), California's first commercially productive well. It was spudded in early 1876 under direction of Demetrious G. Scofield who later became the first president of Standard Oil Company of California, and was completed at a depth of 300 feet on September 26, 1876, for an initial flow of 30 barrels of oil a day. Later that year, after the well was deepened to 600 feet with what was perhaps the first steam rig employed in oil well drilling in California, it produced at a rate of 150 barrels a day - it is still producing after 77 years (1953). The success of this well prompted formation of the Pacific Coast Oil Company, a predecessor of Standard Oil Company of California, and led to the construction of the state's first refinery nearby. 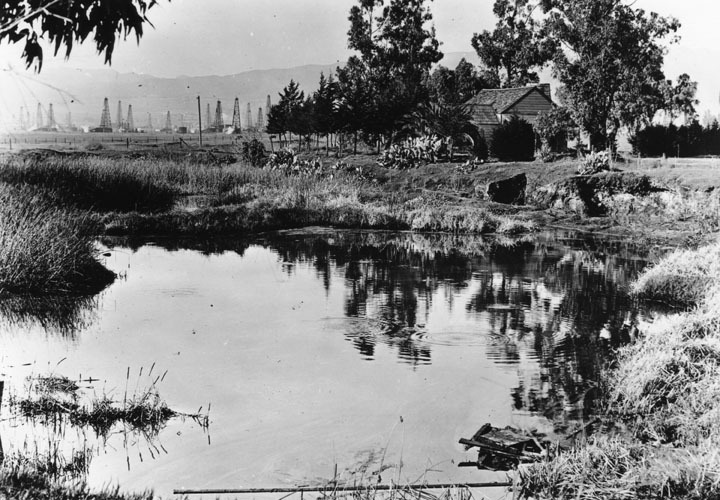 It was not only the discovery well of the Newhall Field, but was a powerful stimulus to the subsequent development of the California petroleum industry. Named after pioneer oil developer Charles Alexander Mentry, who in 1876 drilled the first successful oil well in California. His restored home and barn and Felton School remain here where the Star Oil Company, one of the predecessors of Standard Oil of California, was born. The Portolá Expedition of 1769 encamped at this spring, and it is reported that in 1770 Father Serra said Mass here to the Indians of this area. This spring was also the former water supply of the town of Santa Monica. The site is now the campus of the University High School. This building was constructed by Charles F. Lummis (1859-1928), author, editor, poet, athlete, librarian, historian, archeologist, etc. He selected this site in 1895 chiefly because of a mammoth, ancient sycamore (El Alisal) which has since died and been replaced by four saplings. 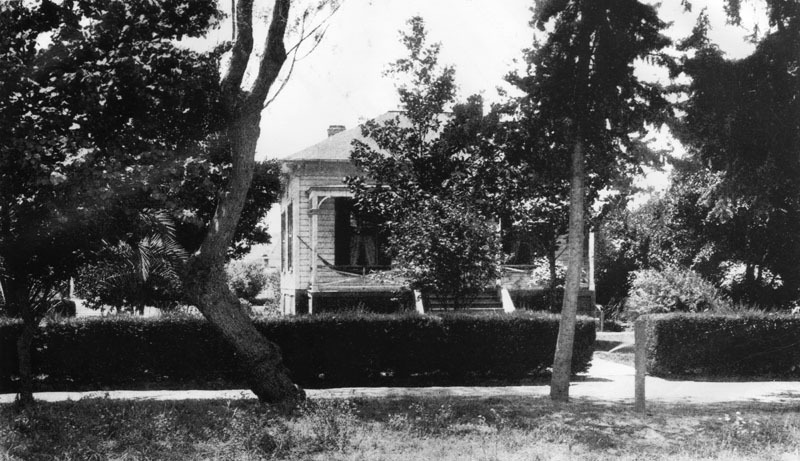 (Early 1900s)* - Exterior view of Charles Lummis' house, 'El Alisal' in Highland Park. (n.d.)* - Exterior view of Lummis House, "El Alisal", located at 200 East Avenue 43, in Highland Park. View shows the front facade. Date built: 1898-1910. Architect: Charles F. Lummis. Lummis was the founder of the Southwest Museum and the California Landmarks Club. Dedicated on September 4, 1880, this original building of the University of Southern California has been continuously in use for educational purposes since October 6, 1880, when its doors were first opened to students by the university's first president, Marion McKinley Bovard. The building was constructed under the guiding hand of Judge Robert M. Widney, the university's leading founder, on land donated by Ozro W. Childs, John G. Downey, and Isaias W. Hellman. (1903)^ - Exterior view of Widney Hall. This was the first building erected on the campus of U.S.C. and the oldest college building in Southern California. Now "Widney Hall", used by the School of Music. The building was built in 1879-80 in a Italianate style, and later remodeled in 1958. (n.d.)* - View of Widney Hall. The building moved several times throughout the years but still stands today. (n.d.)^*** - View of Widney House with the Old College Building on the right. Location: Widney Hall Alumni House, University of Southern CA, Childs Way, between Hoover Blvd and University Ave, Los Angeles. Cecil B. DeMille rented half of this structure, then used as a barn, as the studio in which was made the first feature-length motion picture in Hollywood-The Squaw Man-in 1913. Associated with Mr. DeMille in making The Squaw Man were Samuel Goldwyn and Jesse Lasky, Sr. 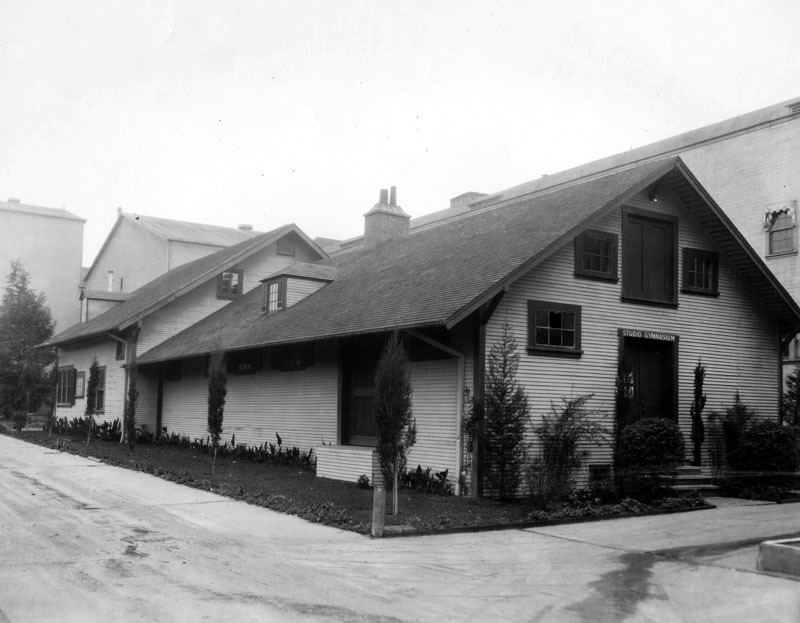 Originally located at the corner of Selma and Vine Streets, in 1927 the barn was transferred to Paramount Studios. (1938)* - View on Paramount Studios lot of "The Old Barn" also known as "Lasky's Barn" where Cecil B. DeMille and Jesse L. Lasky started at the first picture studio. (1956)* - View of celebrities standing on the porch of ‘The Old Barn’ during the California Historical Landmark plaque dedication. 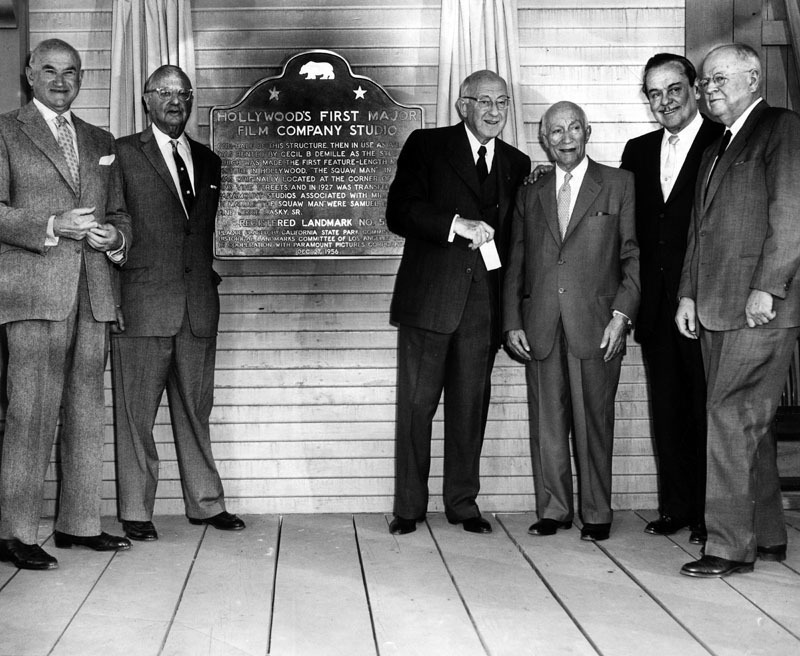 From left to right are: Samuel Goldwyn; Jesse Lasky; Cecil B. DeMille; Adolph Zukor; Leo Carrillo and Y. Frank Freeman. 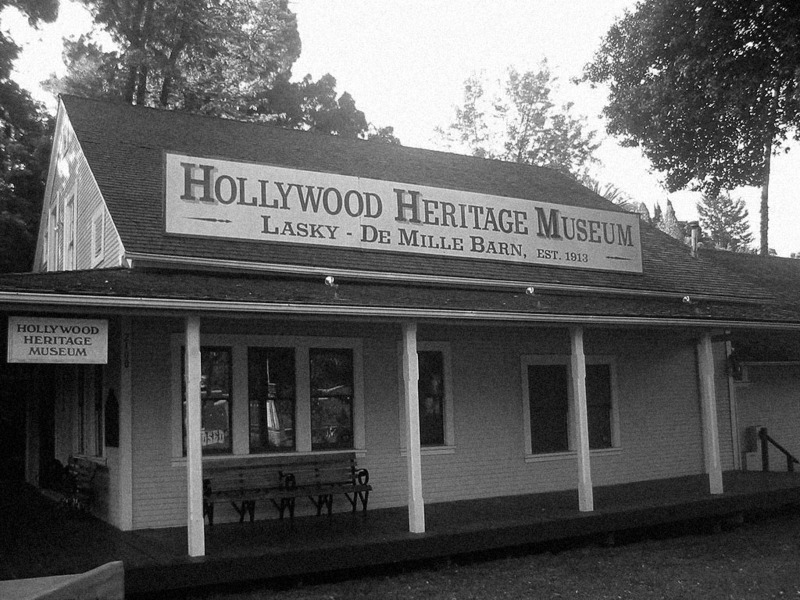 (2007)*^ - View of The Lasky-DeMille Barn at its present day location, 2100 North Highland Avenue (Across from the Hollywood Bowl). In October 1979, the barn was moved off the Paramount lot to a vacant lot in Hollywood. It was then moved by the Hollywood Chamber of Commerce to the parking lot of The Hollywood Palace theater, where it was boarded up and fenced in until a permanent site could be found. 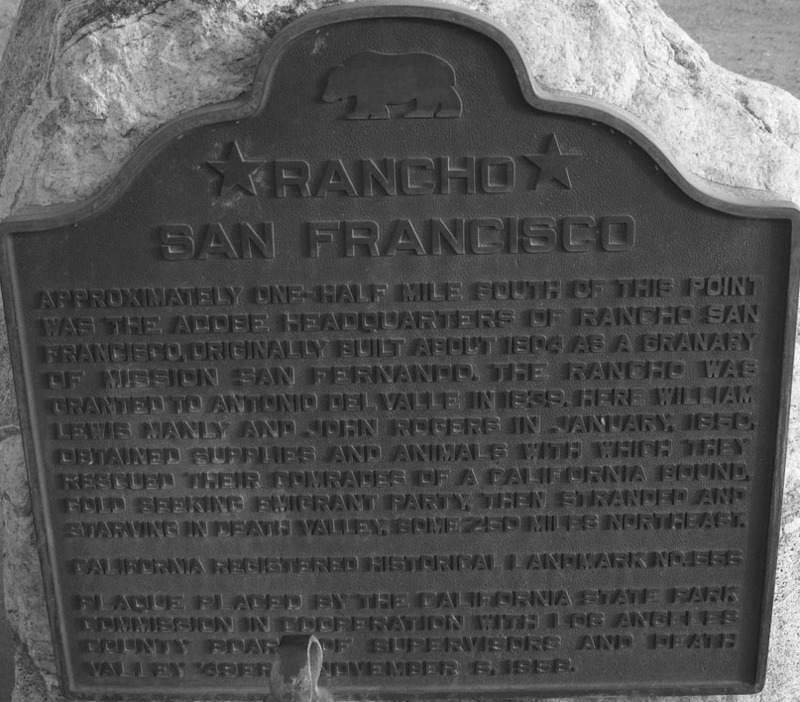 Approximately one-half mile south of the point was the adobe headquarters of Rancho San Francisco, originally built about 1804 as a granary of Mission San Fernando. 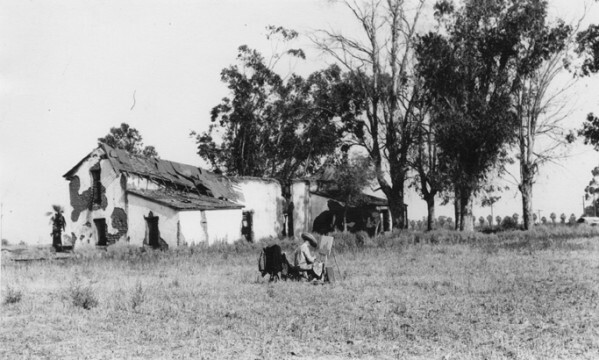 The rancho was granted to Antonio de Valle in 1839. Here, in January 1850, William Lewis Manly and John Rogers obtained supplies and animals to rescue their comrades in a California-bound gold-seeking emigrant party that was stranded and starving in Death Valley, some 250 miles to the northeast. (1843)*^ - Map of Rancho San Francisco, in what is now northern Los Angeles County. Location: SW corner of 'The Old Road' and Henry Mayo Drive, 0.2 mi S of I-5 and State Hwy 126 interchange, Valencia.